Ukraine is one of the largest countries in Europe, second only to Russia in size, and shares borders with Russia, Belarus, Poland, Slovakia, Hungary, Romania, Moldova, and Transnistria (the nation that doesn’t exist). It’s a country with a long, complex, and turbulent history. The Eastern European nation is home to a plethora of beautiful places with a great range of tourist activities. 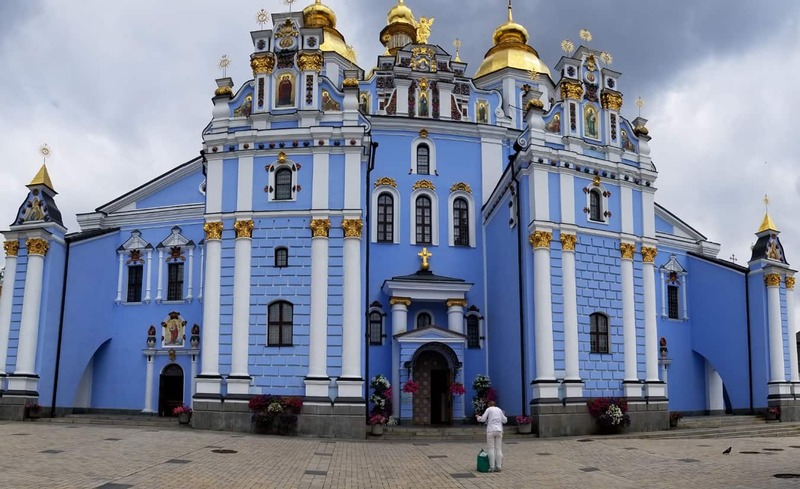 Vibrant cities, golden onion-domed cathedrals, ancient castles, spectacular countryside, Black Sea resorts, catacombs containing mummified Orthodox monks, folk traditions and diverse cultural influences are just some of the attributes that should push Ukraine to the top of your bucket list. 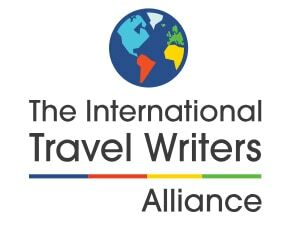 Is It Safe to Tour Ukraine? Click on image to Pin so you can find it again! While many people still refer to this country as “the Ukraine,” that’s incorrect. Russians referred to it as “the Ukraine” before the Declaration of Independence in 1991, when Ukraine was a republic of the Soviet Union. In 1993 the Ukrainian government announced that the country would be called “Ukraine.” Ukrainians are pretty sensitive about that, and are not shy about correcting you. Yes, Ukraine is safe, as long as you stay away from the far eastern part of the country. There is an ongoing territorial dispute with Russia over the Crimean peninsula and the U.S. Department of State has issued a warning for U.S. citizens to defer all travel to Crimea. 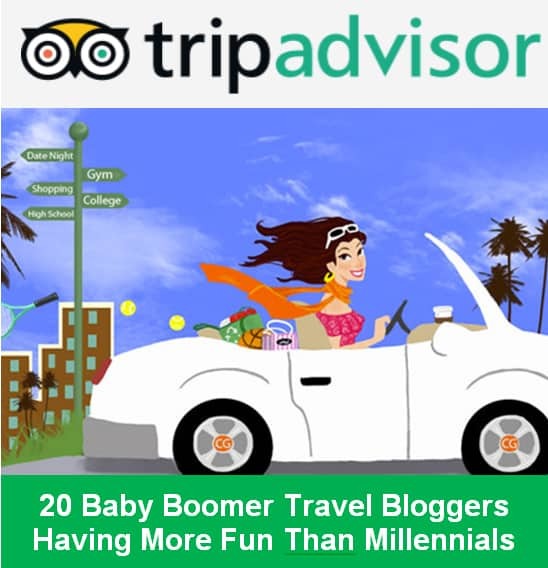 But there are no restrictions on the rest of Ukraine, and especially not the three largest and most beautiful tourist-worthy cities that are in Western Ukraine: Kiev, Lviv, and Odessa. I’d just like to add one caveat… pickpocketing is a problem, mostly in Lviv. This is similar to other highly visited cities like Barcelona, Athens, Paris, and Rome where pickpocketing is rampant. Just take the same precautions as you’d take when visiting those cities and you’ll be fine. Ukraine has struggled to attract visitors. For me, the absence of mass tourism offers an appeal and authenticity often missing in other European cities and compelled me to explore this fascinating country. 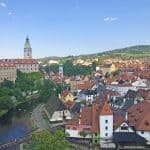 After a couple of weeks in budget-breaking Central Europe that was annoyingly jammed with tourists, the prospect of having some elbow room to explore made me positively gleeful. Ukrainians are friendly and welcoming, but most don’t speak English, although this is starting to change with the young. And then there’s the wholly unfamiliar Cyrillic alphabet. 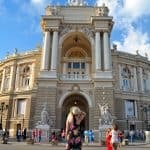 These are things to consider when planning a trip to Ukraine. 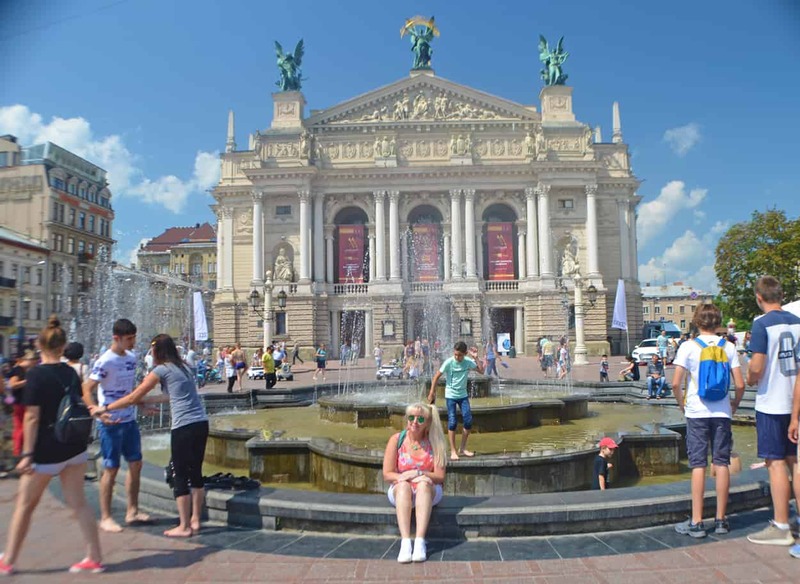 I toured Lviv, Kiev, and Odessa with JayWay Travel. If you want stress-free travel, this is the way to go. 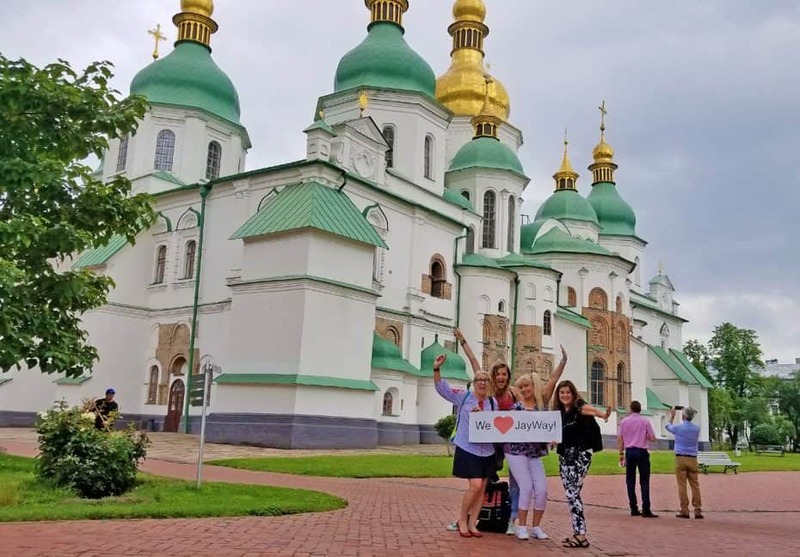 They are a boutique tour organizer with local representatives who will take care of all your needs from the time your toes touch Ukrainian soil. But at the same time, you can customize your itinerary to have as much or as little guidance as you like. Each of Ukraine’s three very special cities has its own charm, different than the other two. 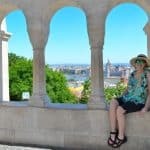 Here are my top 11 things to do and see in each of these cities and some recommendation of traditional Ukrainian food to try. Are you ready to fall in love with Ukraine? Kiev (known locally as Kyiv and pronounced keeve – one syllable) is the bustling capital and largest city in Ukraine, home to some three million people. 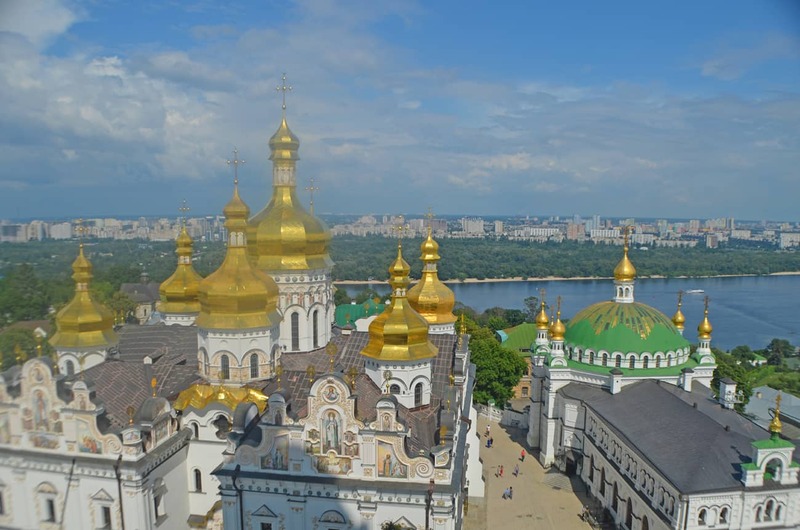 A blend of ancient and modern, it’s a scenic city resting on both banks of the Dnipro River, with beautiful cathedrals and monasteries, lots of green spaces and burgeoning enthusiasm. Founded in the 5th century, ancient Kievan Rus reached its greatest period of dominance during the 11th and 12th centuries when it was a major center of trade routes between the Baltic and the Mediterranean. One of the city’s major landmarks, you can’t miss the bright yellow, seven-domed, 19th-century Byzantine-style church. Inside, a colorful fresco-filled interior hosts Ukrainian Orthodox services. 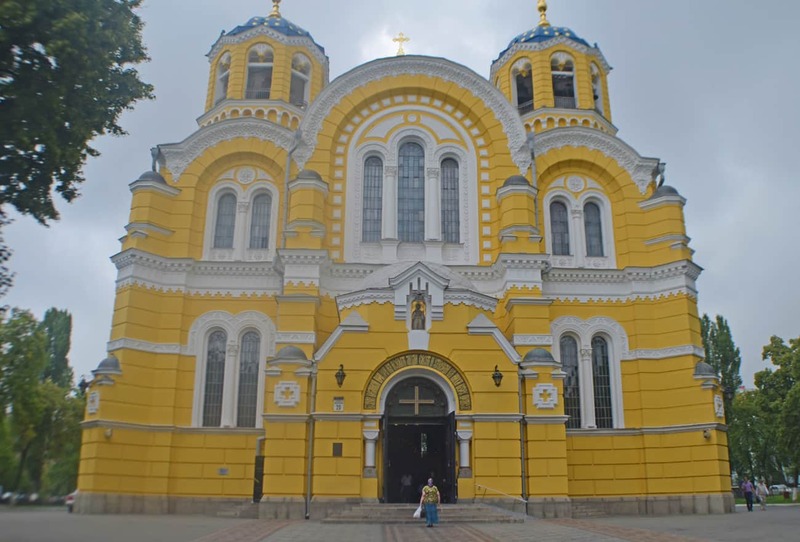 St. Volodymyr’s Cathedral was built in honor of Prince Vladimir of Kiev, who introduced Christianity in Kievan Rus in 988 A.D.
St. Sophia was the first UNESCO World Heritage site in Ukraine, and with your first sighting, it’s easy to understand why. Centuries before the Czars, Kiev was the center of Slavic spirituality. 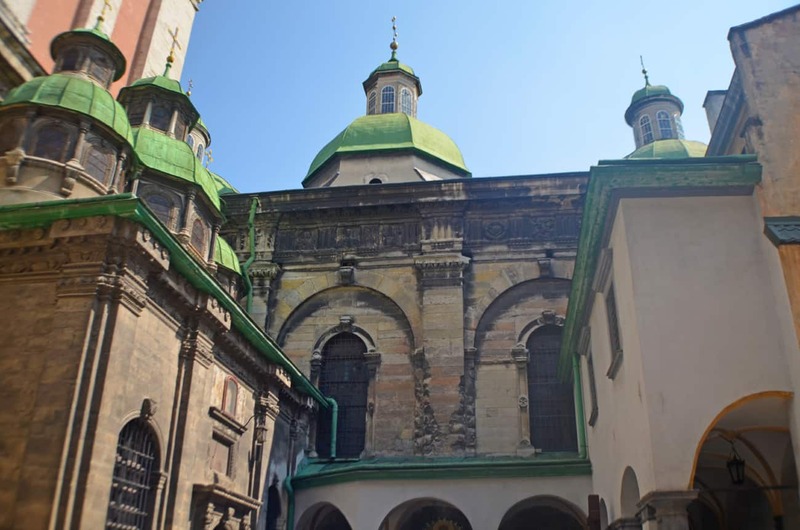 The Byzantine cathedral is the oldest church in Kiev, dating back to the 11th century. 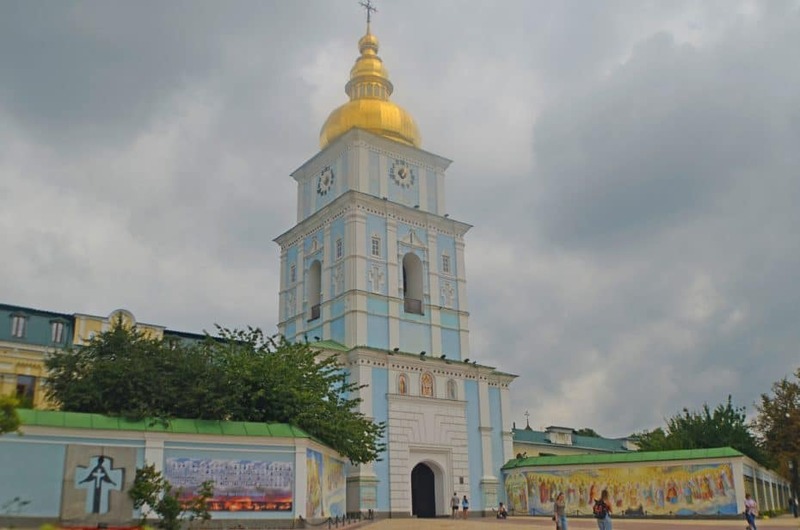 It’s where the princes were crowned in Kiev’s heyday. The church is no longer active but offers a museum of Byzantine history and architecture. The gold and green onion domes are exquisite, but it was the inside of St. Sophia that really resonated with me, and my only regret was that photos were prohibited. Unlike the other churches in Kiev which are decked out in the finest gold leaf and stained glass, the interior of St. Sophia was unique in its simplicity. The ancient wooden arches seem more Gothic-style with original frescoes and mosaics, all currently being painstakingly restored. The medieval authenticity transported me back to an era that has fascinated me for most of my life and St. Sophia’s stayed with me, even now. 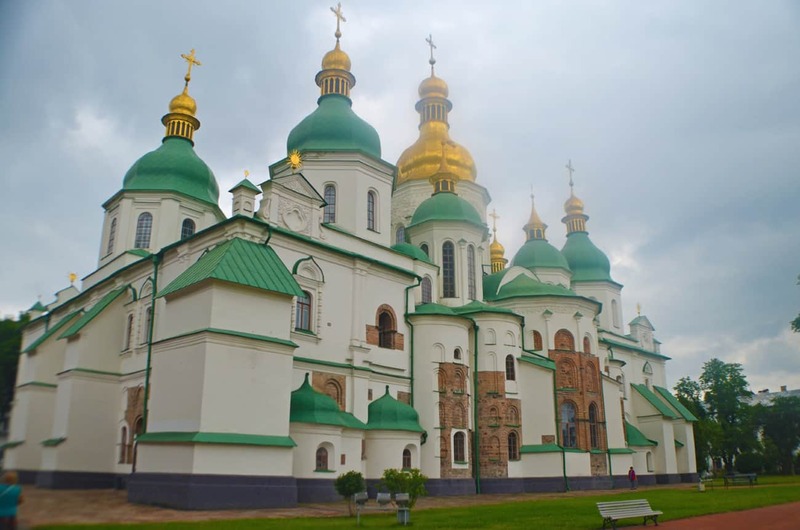 Gold-domed St. Michael’s Monastery, on the right bank of the Dnieper River, has had a troubled history. In 1937 it was torn down by the Soviets to provide space for a massive communist square. The communist vision for the square was never fulfilled, and the monastery was restored in 1999. St. Michael’s, now the most vibrant shade of periwinkle blue imaginable, is a functioning sanctuary with services officiated by the chanting, robed priests who live on site. Who can resist a church painted your favorite color? 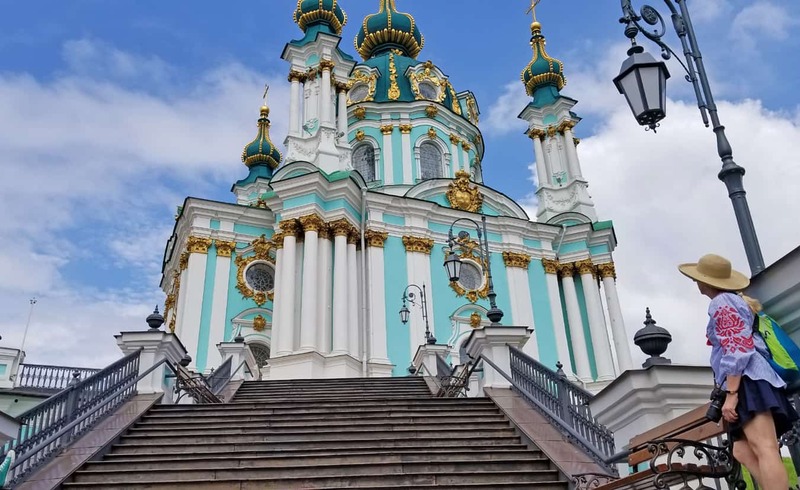 St. Andrew’s Church in Kiev is a strikingly unique bright aqua Baroque building. The church was built on an artificial hill. 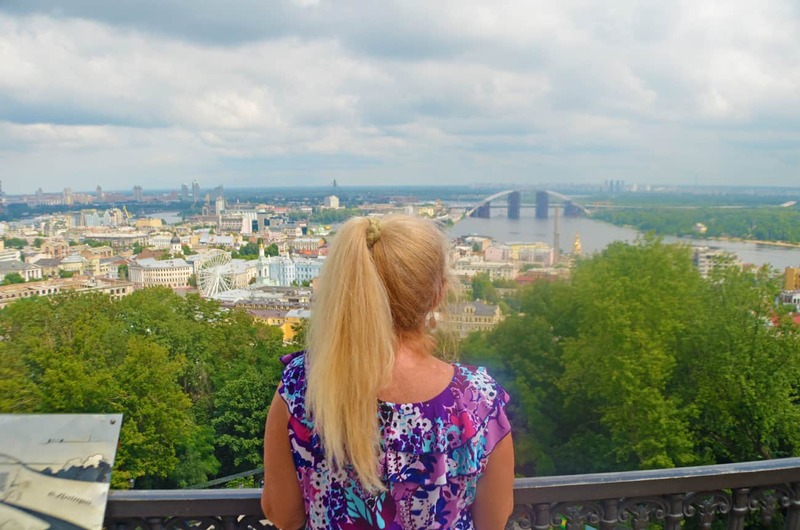 I climbed just a couple flights of stairs and was surprised to discover an open-air terrace with a panoramic view of one of Kiev’s oldest neighborhoods and the Dnieper River. Parts of the complex existed before Norman conquer when monks prayed in their caves before the first crusades. 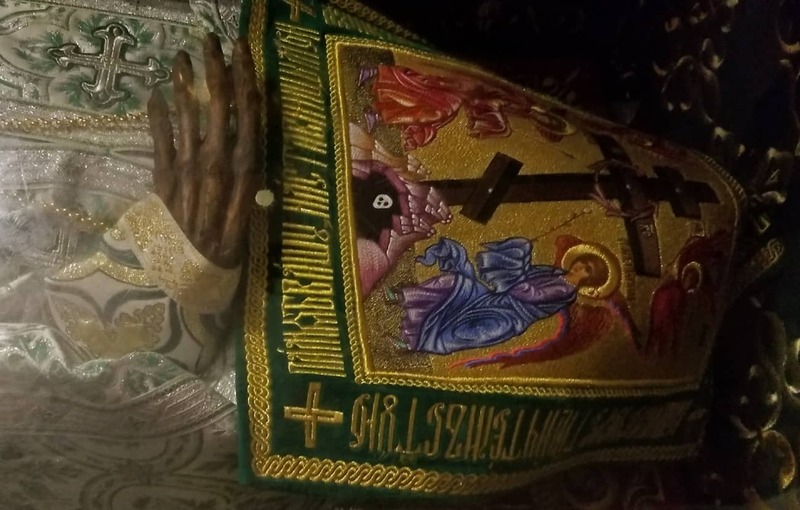 I squeezed through the labyrinth of narrow catacombs to find coffins, end on end, with the mummified bodies of monks who once lived on the premises. Interesting, albeit somewhat morbid. 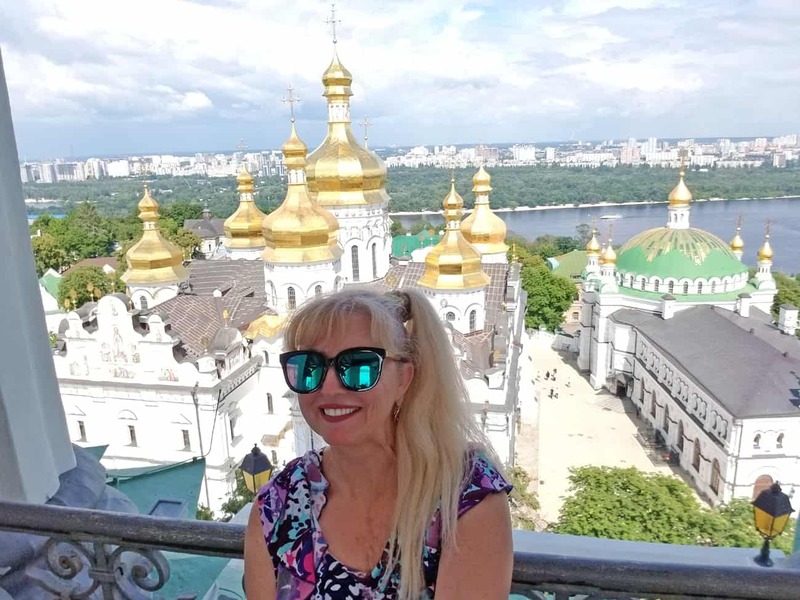 If you have the stamina, climb the bell tower for a panoramic view and great selfie opportunity with the brilliant gold domes of the Dormition Cathedral and Dnieper River in the background. Mezhyhirya, also known by locals as “the Museum of Corruption,” is the palace where Viktor Yanukovych lived when he was President of Ukraine. The outrageously decadent estate was originally founded as a monastery. 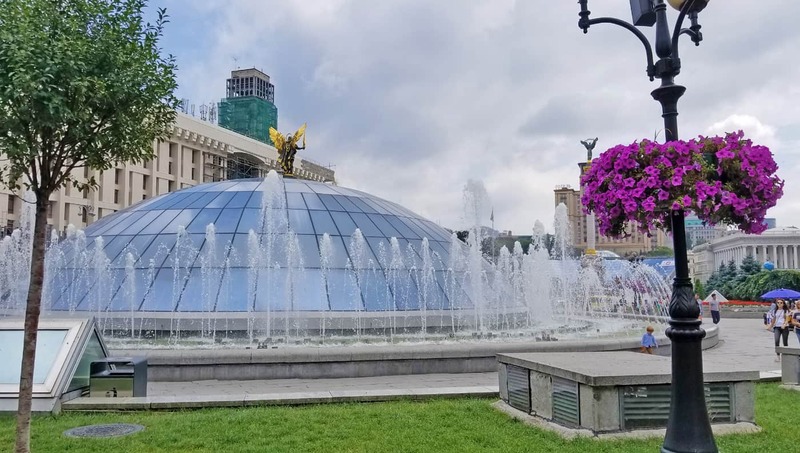 Now, it’s a state-owned museum, opened to the public in 2014 as a tangible testament to the excessive, lavish lifestyle of the former president. Yanukovich fled to Russia during the Maidan Revolution. We were told we would have a “very special” guide to show us the palace. You can imagine our surprise when we were met by one of the original Activists of Automaidan who took care of the residence after it was stormed (without looting) in 2014. He had an austere demeanor and wore a traditional Ukrainian costume, and his pride in his position and country were palpable. 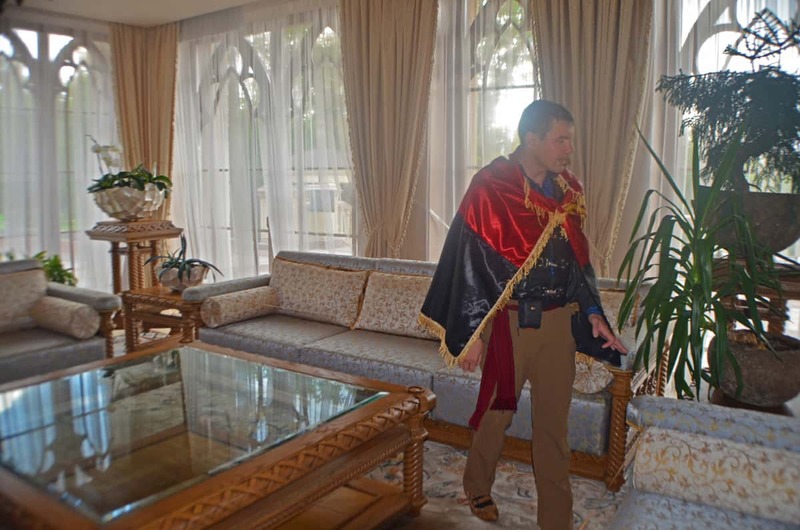 You can tour the palace and other buildings, and artificial lakes and lush gardens on the grounds, either by foot or in an escorted golf cart. The Golden Gate was constructed in 1037, during the Kievan Rus period. It served as both a defensive structure and entrance to the city. In 1970, a pavilion was built over the ancient ruins to preserve the gates as well as recreate the original appearance. Also known as Independence Square, Maidan Nezalezhnosti is the central square of Kiev and where the Orange Revolution took place in 2004. It’s a large open space with fountains that light up with colors at night and surrounded by shops and restaurants. Our hotel was just a few minutes’ walk from “the Maidan,” and it was fun to see the differences between weekdays and weekends, and day and night. 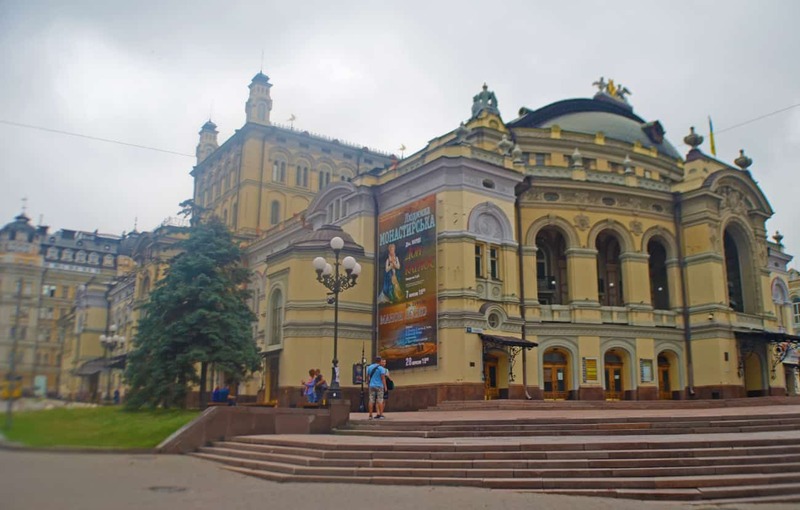 The National Opera of Ukraine was built in the style of the French Neo-Renaissance and continues to be one of the most famous ballet and opera theaters in Europe. It offers an extensive repertoire of ballets on a level with the Bolshoi Theatre in Moscow and the Mariinsky Theater in St. Petersburg, and all three are united by a common Russian ballet school. Having studied ballet until early adulthood, I was thrilled by the chance that I might see a classical “Russian/Ukrainian” ballet, but alas, no performances were scheduled when I was there. What a treat to cast off with Captain Sergio for a sunset sail along the Dnieper River. With the cityscape as a backdrop, we were indulged with wine, cheese, fruit, pastries, and Ukrainian cherry liqueur in the billowy sailboat. The Motherland statue is a Soviet war memorial. 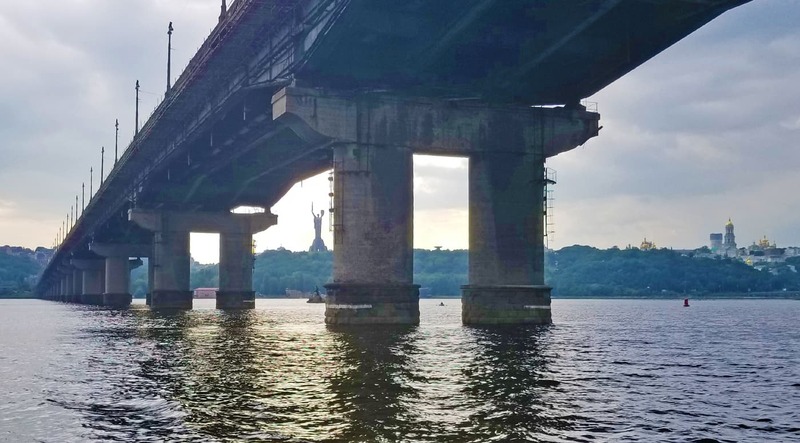 At 335 feet high, the Motherland (peeking out from under the bridge) is even taller than Statue of Liberty. The statue commemorates the soldiers who perished during WWII. 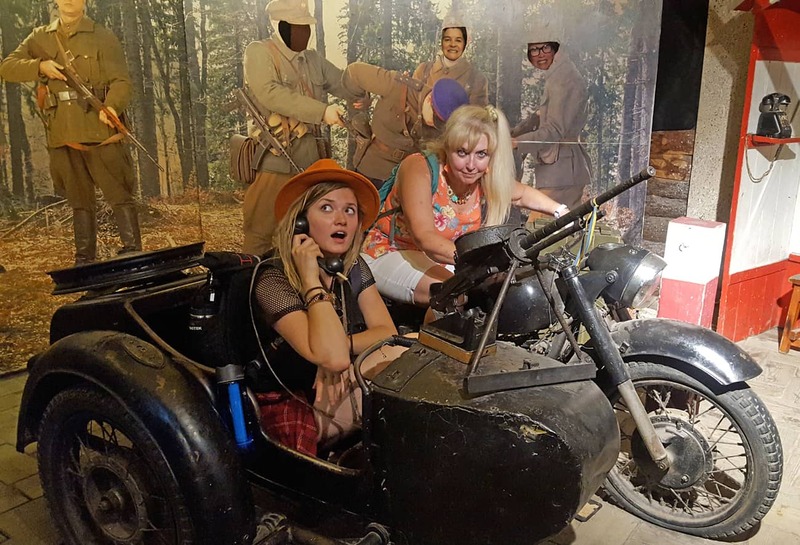 The associated museum holds exhibits from WWII, Nazi occupation, and the liberation of Ukraine by the Red Army from the Nazis in 1945. 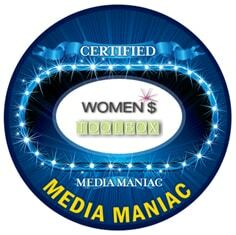 And you can get inside her head…literally. Climb the stairs and you’ll be treated to a panoramic view of the city. Yes, there’s a beach in Kiev! Hydropark is an island recreational park on the Dnieper River. It has a sandy beach but you might want to think twice before swimming in the murky river water. However, there are other activities for a fun day, such as volleyball, boat and kayak rentals, paintball, ping-pong, beach bars, a museum of miniatures, and an open-air gym made from metal trash. I did not have an opportunity to check out the beach, but I understand it’s jam-packed on hot summer days. 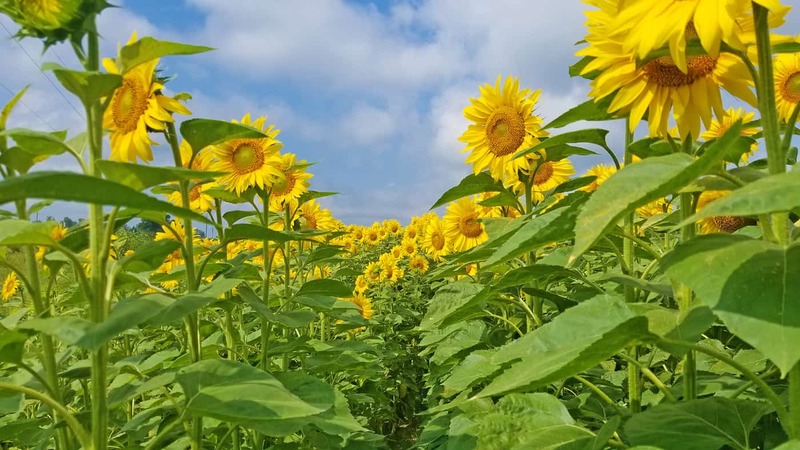 The sunflower is Ukraine’s national flower, probably because they are the 2nd largest producer of sunflower oil in the world. 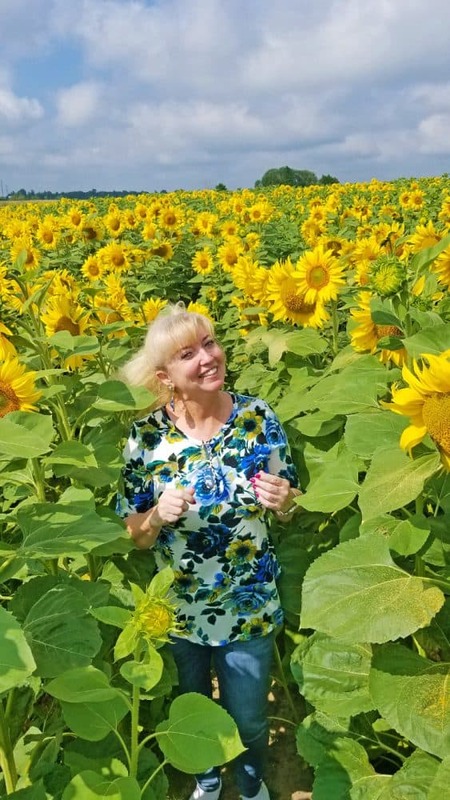 How lucky for me – I adore sunflowers! How unlucky for our private driver…..
As we were cruising through the countryside, I yelled, “Stop! Pull over!” as we entered an area with sunflowers as far as the eye could see, on both sides of the road. He stopped and patiently waited as I spent a good 15 minutes frolicking and taking photos in the cheerful yellow fields. 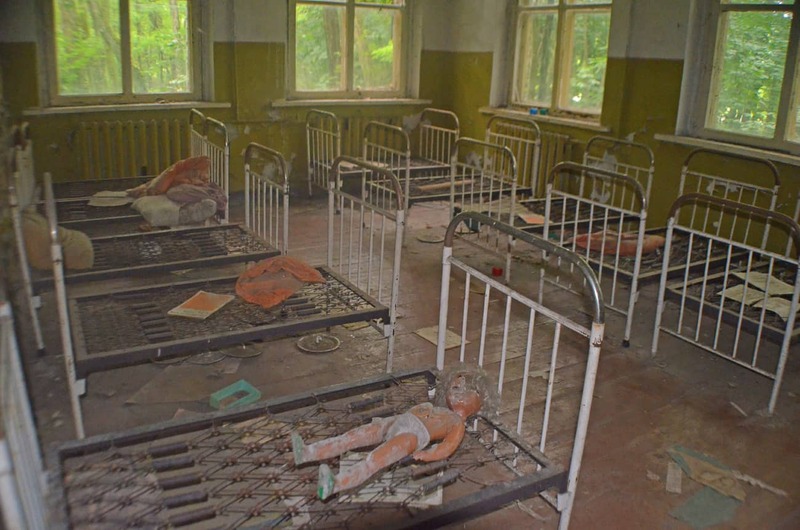 The site of the world’s worst nuclear disaster, Chernobyl has become an unlikely, dark tourist destination. There are strict safety regulations to follow if you want to visit the Exclusion Zone which includes the nearby ghost town, Pripyat. You must apply well in advance of your visit with passport information, and are only permitted to tour certain areas with one of their pre-approved guides. While the radiation I was exposed to was less than I’d received on my flight from the U.S. to Ukraine, our guide had a hand-held Geiger counter with him at all times. Before the 1986 nuclear catastrophe, Pripyat – Ukraine’s model town – had almost 50,000 residents and an income 40% higher than the rest of Ukraine. 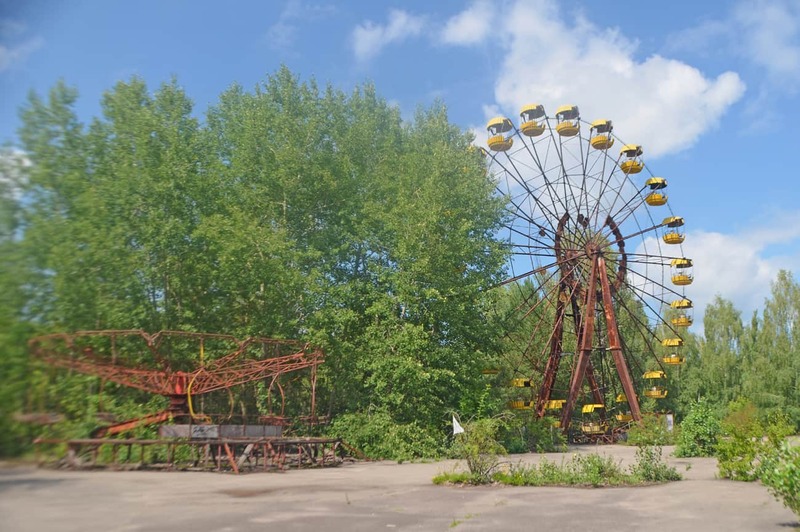 Pripyat was evacuated two days after the disaster and contains an abandoned amusement park, hotel, schools, and government buildings. Cherynobyl affected me deeply, especially visiting the kindergarten/day care. To be 100% honest, it was not only one of the most fascinating, educational and visual experiences in Ukraine, but also in the world. If you ever have the opportunity to see it, don’t pass it up. 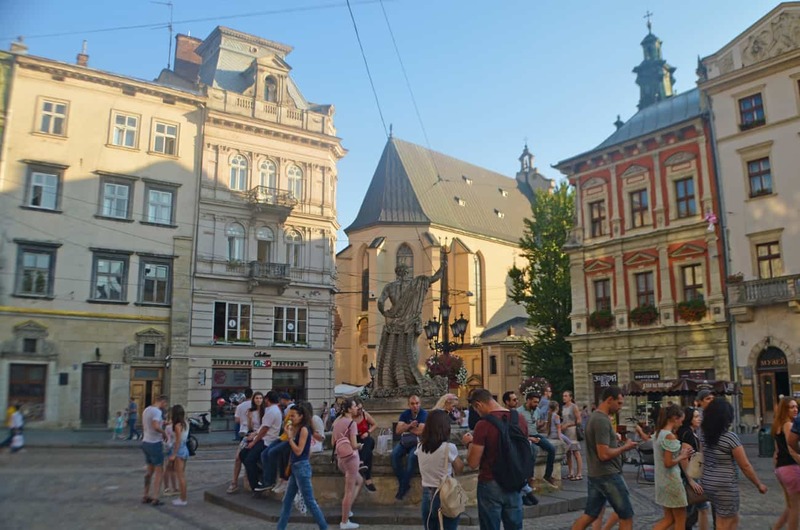 Founded in 1256, and once the capital of a powerful Slavic state called the Galicia-Volyn principality and later part of Poland, the stunning medieval city of Lviv is just 40 miles from the Polish border. 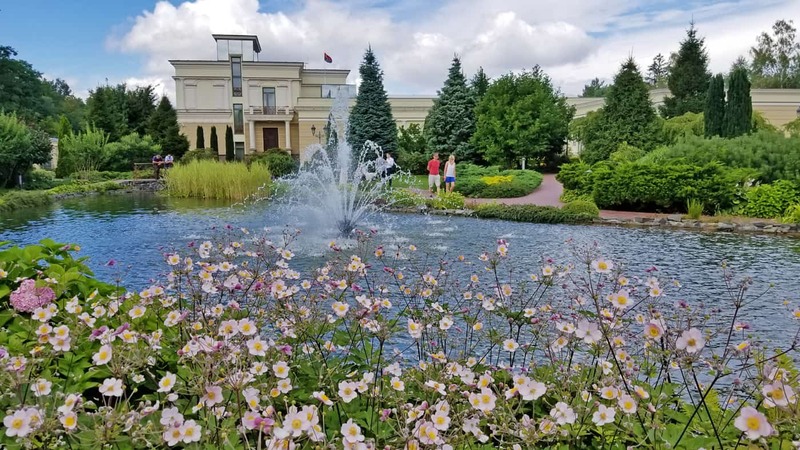 It’s a popular weekend retreat with Ukrainians but has yet to be discovered as a vacation destination by U.S. tourists. Narrow cobblestone medieval streets, attractive town squares, ornate churches, and umbrella-lined outdoor cafes all beckon. 16th-century Austro-European, Renaissance, Baroque, and Art Nouveau architecture, mesh together in what many consider to be the most beautiful city in Eastern Europe. 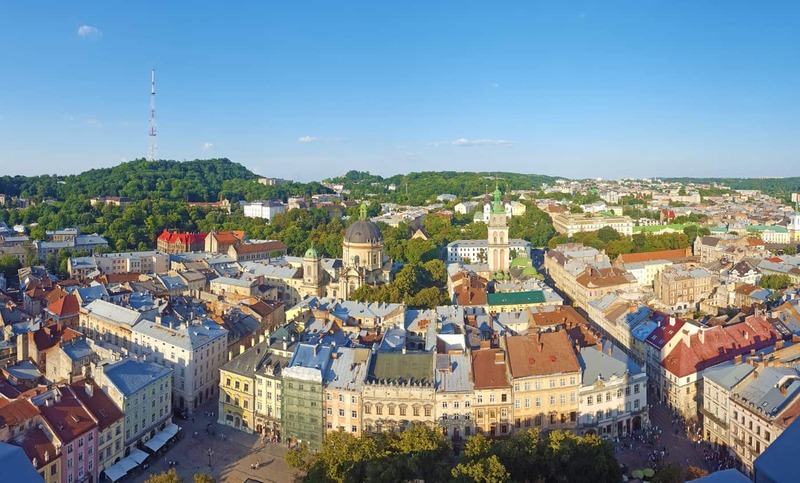 Lviv has had a turbulent past, having been ruled by Poland, Sweden, the Austro-Hungarian Empire, Nazi Germany and the Soviet Union. Amazingly, the city is remarkably preserved. It’s more like what you’d find in Western Europe, and as such, it’s been known as Ukraine’s “capital of culture” for three centuries. But unlike those more popular cities, you’ll seldom find Lviv crowded. Somehow this enchanting destination has remained a secret. Having survived both World War II bombings and the demolition tendencies of the Soviet Union, in 1998 Lviv’s Old Town was listed as a UNESCO list of World Heritage site. It is considered so beautiful as to have earned the title “the Paris of Ukraine.” You can literally spend days walking around this section and not tire of it. Rynok Square, also known as Market Square, is the heartbeat of Old Town. 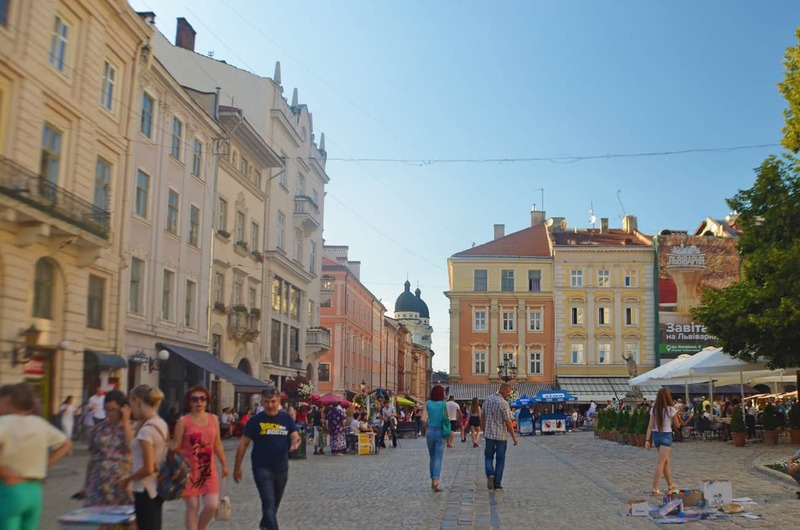 Most of the cobbled roads and alleys in Old Town will lead you to this square which is surrounded by pastel-colored cafes, boutique shops, bistros, and bars. In the summer months, you’ll find street performers playing music on every corner and the smell of coffee and pastries from the Viennese-style coffee houses enticing you to stop and partake. In the middle of the square is the Town Hall. 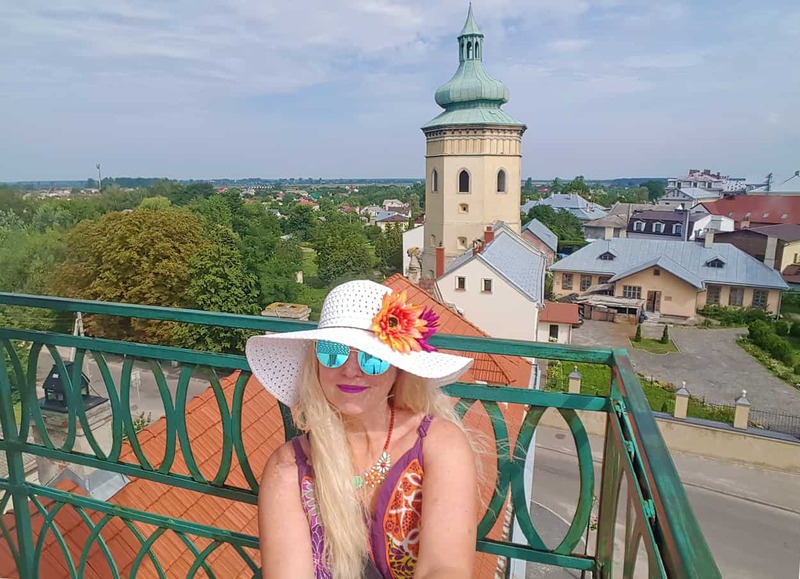 I climbed 400 steep, narrow, worn-out spiral steps located inside the Town Hall to the top of the bell tower, 213 feet, for the best 360° view of Old Town and beyond. Built in the 19th century by Polish architect Zygmunt Gorgolewski to mimic Vienna’s opera house, the Lviv Opera House is a landmark and one of the most opulent buildings in the city. The style is a fusion of Baroque and Renaissance style architecture, displaying statues, sculptures, and paintings. The theatre offers ballets and operas. Ukrainians take their coffee seriously, and there’s no better place to get a good overview than Lviv Coffee Mining Manufacture, located right on Rynok Square. When we first entered, we got a look at the process of how the fresh coffee beans are ground. After we were handed a miner’s helmet we headed down through a series of low, damp, underground tunnels. We emerged into a cavernous space and sat down at one of the rugged wooden tables and stools. Mugs of steaming coffee were set in front of us. 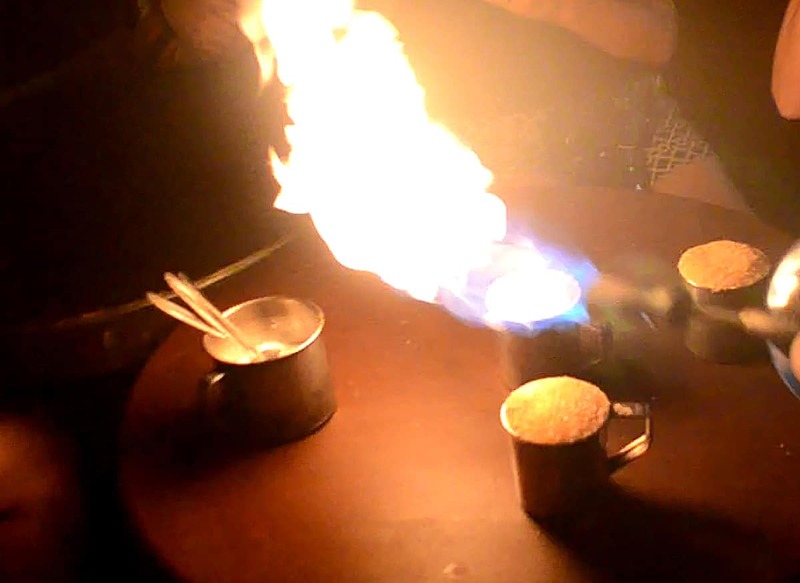 Immediately, someone with a blow torch lit our mugs on fire! We let it cool a bit so as not to burn our lips, and then there was a chorus of “mmmmmm” as we tasted the sweetly caramelized top of the scorched coffee. If you can find it, you’ll have the best time here! Knock on the unassuming door and when the tiny peak-window opens, say the password, “Slava Ukraini!” (Glory to Ukraine!). A guard, dressed in an old Ukrainian Insurgent Army uniform from World War II will give you a shot of honey vodka, check to make sure you’re not a Russian spy, and then let you continue down through the tunnels into the “bunkers” for more vodka. Kryivka is a labyrinth of photo ops, with newspaper clippings, army uniforms, antiquated rifles, and motorcycles you can hop on while “Russians” try to shoot you down. We had a rip-roaring hilarious time here! In the 13th century, the northern part of the city became a haven for Armenians and is now known as the Armenian Quarter. We loved the 16th Armenian cathedral, whose exterior and interior are both impressive, with a mosaic dome and 600-year old paintings. 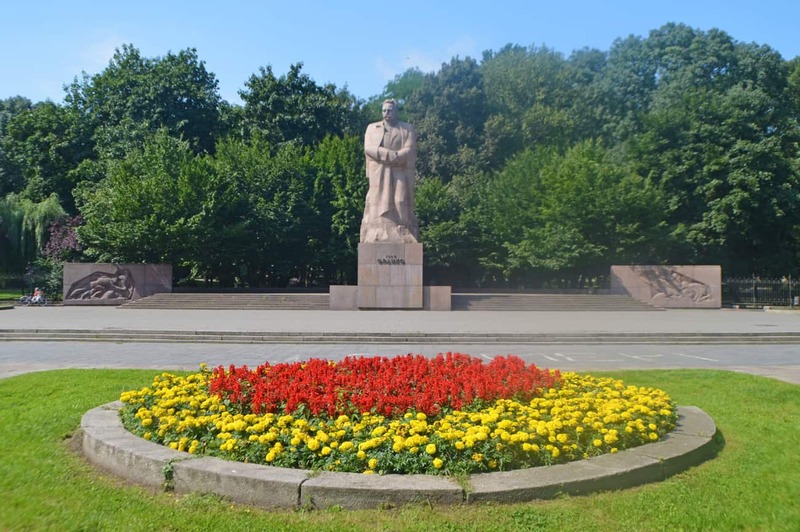 Ivan Franko Park, across from Lviv University, is the oldest and first public park in Ukraine. Formerly known as Kościuszko Park and the Jesuit Gardens, the park has three colossal oaks in the upper part which are said to be the oldest trees in Lviv at over 300 years old. The park’s namesake, Franko, was a Ukrainian poet, writer, economist, and political activist. 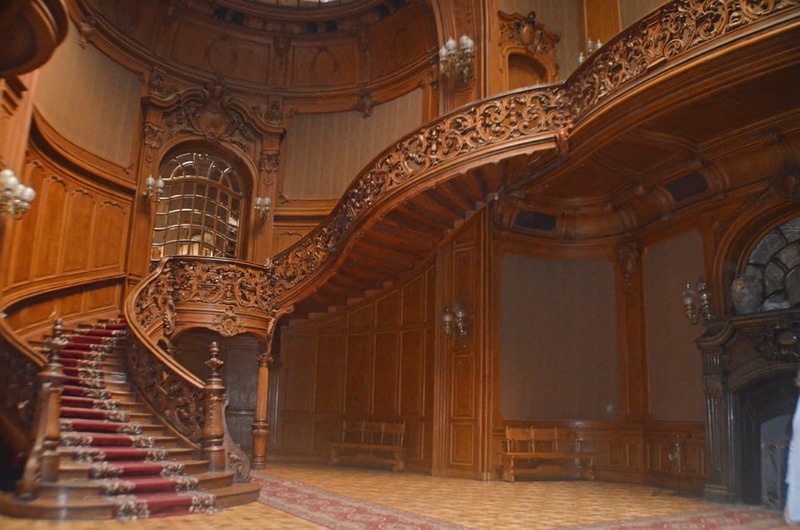 Built in 1898, the neo-Baroque palace is dominated by a massive ornately-carved oak spiral staircase, displayed as soon as you enter. Elegance abounds in the marble fireplaces, crystal chandeliers, velvet upholstery, and silk and flocked wallpaper. Although the building gives the impression of stepping back in time, it’s vacant. In the past, the building has been used as a casino as well as a location for film shootings. 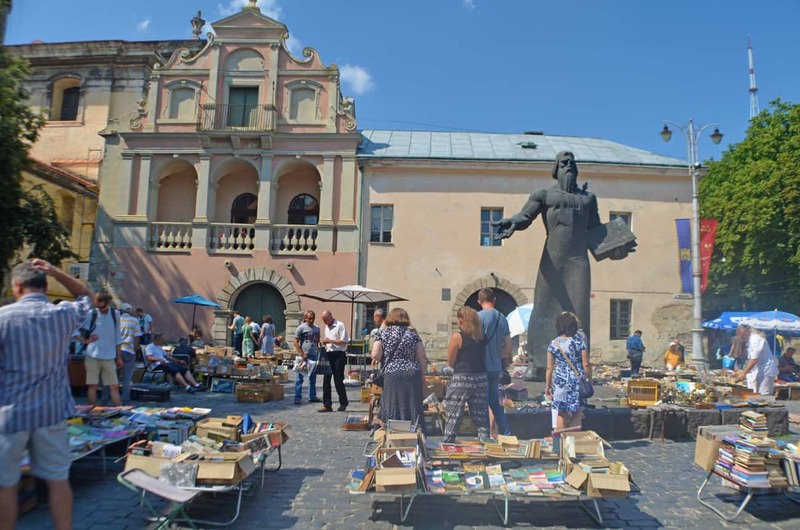 The handicraft market is a must if you’re looking for souvenirs from Lviv. 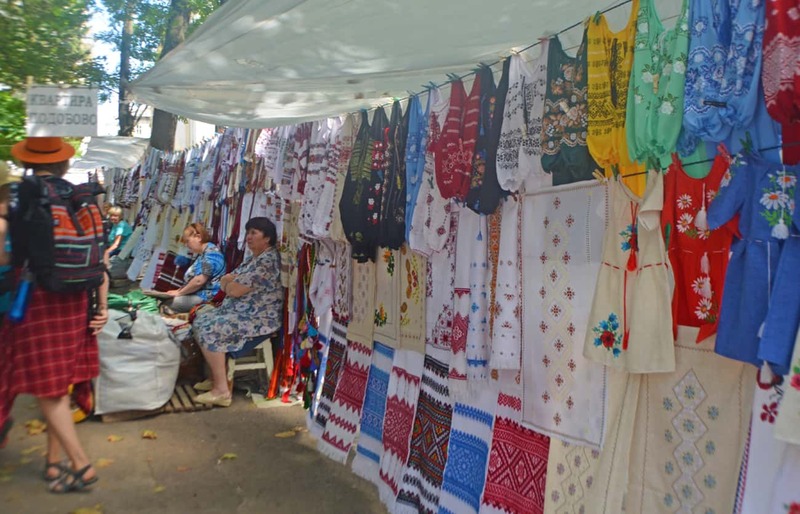 Here you’ll find painted wooden nesting dolls, antique Ukrainian and Russian army medals, and traditional Ukrainian vyshyvanka embroidered blouses. English is not widely spoken, so to bargain for souvenirs I had to type my offers on the shopkeeper’s calculator. 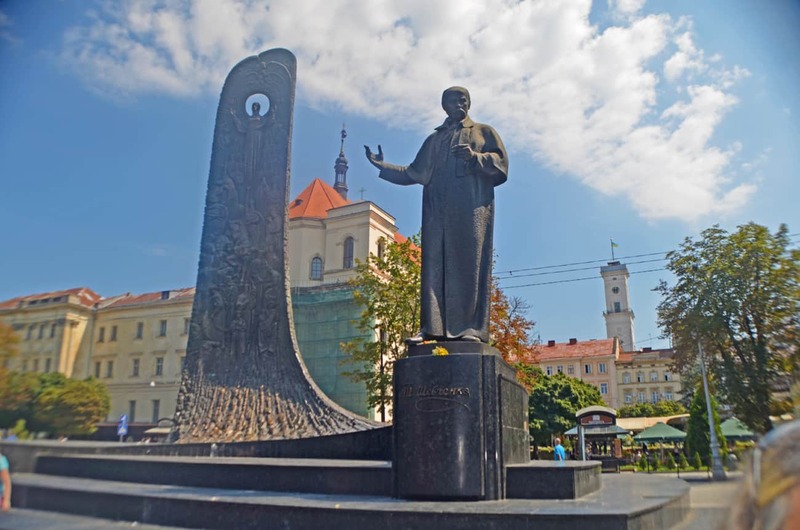 There’s a small square on Pidvalna Street, with a statue of Ivan Fedorov, the 18th-century father of Slavic printing and first person to publish books in Ukraine. We meandered into the interesting market which was selling used books, antique trinkets, old Soviet vinyl records, and some clothing. Although we could not read the books which were written in Ukrainian and Russian, it was fun to leaf through the retro cover designs, and I’m sure there were some great deals. The 1327 ancient castle was owned by Poland, Lithuania, and Hungary in its past and is considered to be one of the oldest forts in Ukraine. 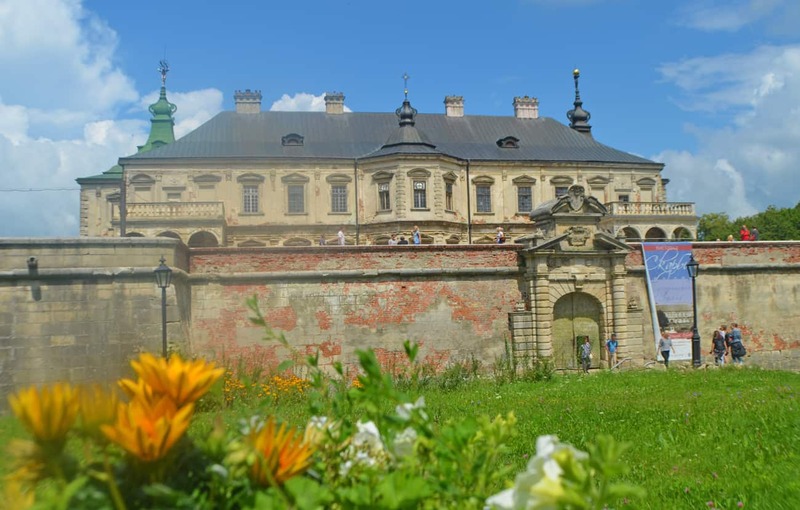 Polish King Jan III Sobieski, most known for stopping the advance of the Ottoman Empire in Europe, spent many years of his life at Olesko Castle. Nowadays the castle is a museum with exhibits of restored objects, exclusive masterpieces, sculptures, blown glass, and tapestries. 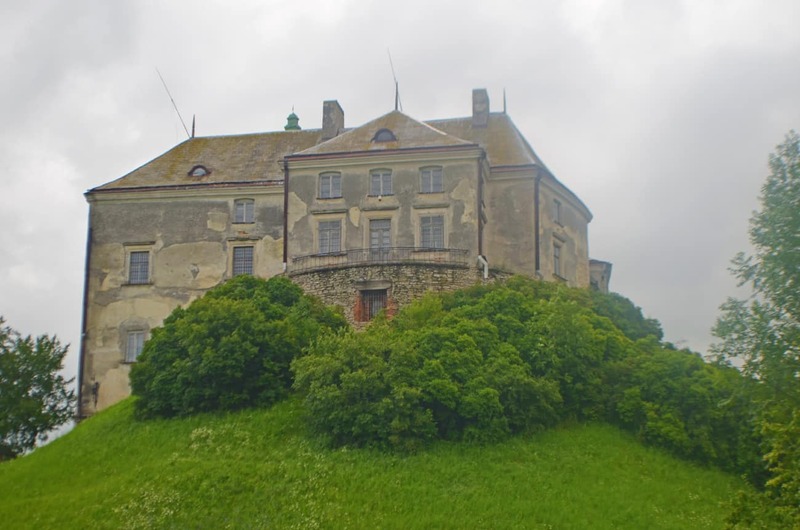 Constructed from 1635 – 1640, Pidhirtsi, more a luxurious Renaissance chateau/fortress than a traditional castle, is one of the best-preserved, famous, and most attractive palaces in western Ukraine. But this was not the case in the 19th century when the castle was neglected and the majority of its treasures were sold. By the end of World War II, the castle stood in utter disrepair. It became a sanatorium during Soviet occupation which substantially changed the interior function, structure, and decor. Massive, ongoing renovations of the castle began in 1997. A one-thousand-foot path leads from the castle to the Roman Catholic Church of the Exaltation and St. Joseph. The Baroque church was built near the palace in the 18th century and can be visited at the same time. Zhovkva, a small town north of Lviv, was established in 1597 and has a population of about 13 thousand. Since the foundation, the city has housed many different peoples, including Poles, Jews, Russians, Tatars and Armenians. The town center of Zhovkva was declared a heritage and architectural site in 1994. 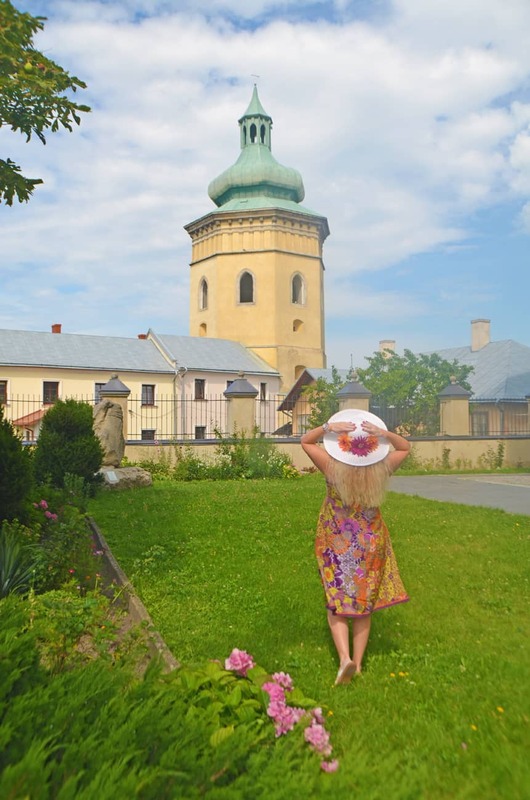 The architecture includes the Zhovkva Castle which is the town’s oldest and largest building, Dominican Monastery complex, the Church of St. Lawrence, the Basilian monastery, the city hall, and bell tower (climb for amazing views! ), and 1720 wooden Holy Trinity Church UNESCO World Heritage Site. 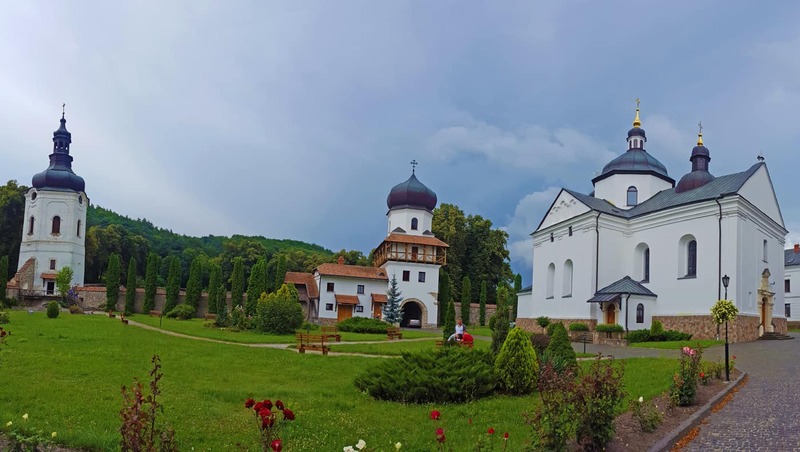 The 16th-century Basilian monastery is one of the most significant Greek Catholic shrines in Ukraine, and a popular pilgrimage destination. The monastery was hard hit after the Soviet occupation in 1939. Ten years later, the monastery was closed; some of the monks escaped and went underground while others died in Soviet prisons. After the collapse of the Soviet Union, it was renovated and reopened to the public. 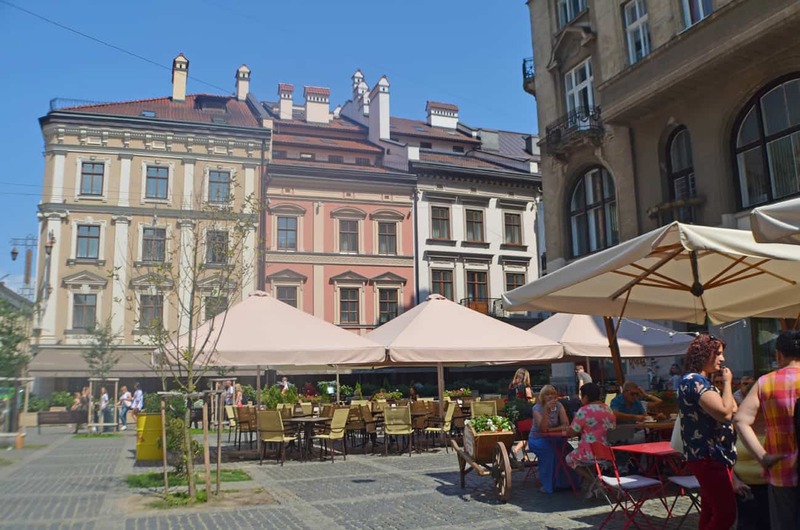 Click here for a comprehensive list of the BEST restaurants in Lviv. Odessa, on the Black Sea, is one of Ukraine’s largest seaports. Founded in 1794 by the Russian Empress Catherine the Great, the city is relatively young compared to Kiev or Lviv. 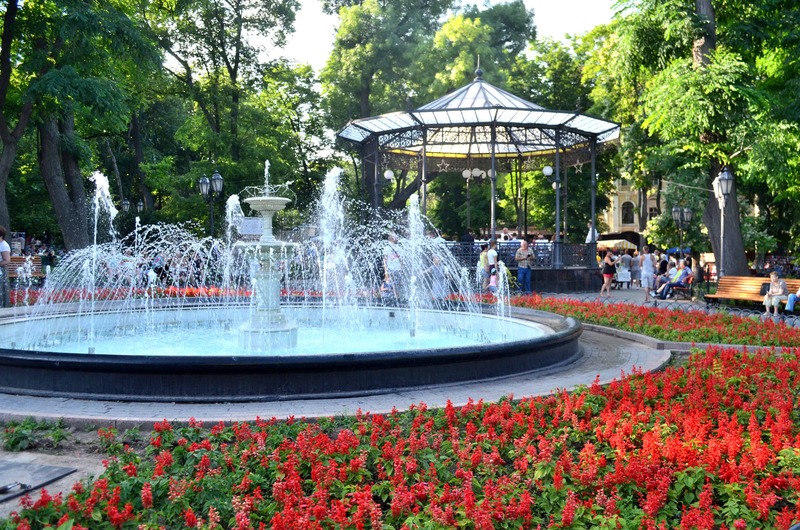 Odessa is the summer capital of Ukraine, attracting tourists to the city’s beautiful historic district with its pastel neoclassical architecture, historical monuments, delicious cuisine, and seaside resorts. The city is currently enjoying a boom as travelers are staying away from the political unrest in Crimea and heading to Odessa instead. 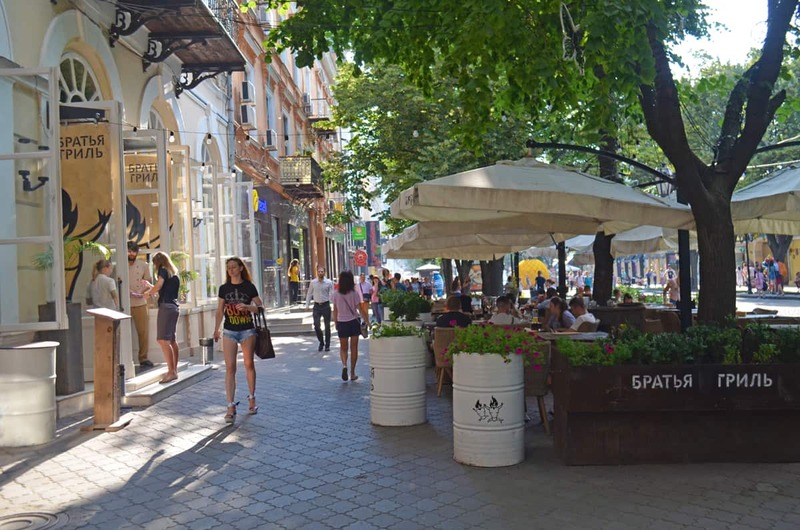 In the center of town, Deribasovska Street is a wide, tree-lined pedestrian boulevard cradled on each side by opulent European-style buildings, landmarks, sidewalk cafés, shops, and music. It’s a festive and vibrant spot populated by tourists and locals, a veritable ground zero for people watching. In a city filled with exquisite decadent 19th-century architecture, one building really stands out. 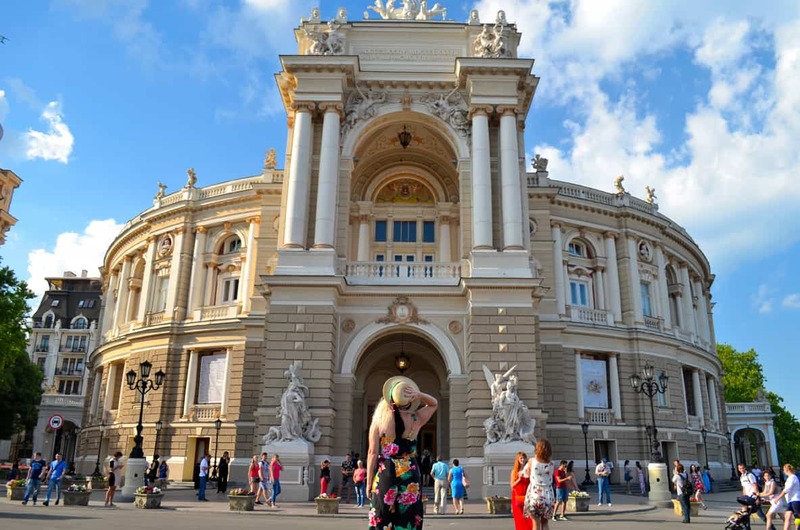 Odessa’s sumptuous National Opera and Ballet House was designed by the same architects as the Vienna State Opera and is the heartbeat of the city. The impressive Baroque building is adorned with sculptures of mythical figures and is considered one of the most beautiful in all of Europe. If there’s a concert featuring the music of Russian composers Tchaikovsky or Stravinsky, or a ballet, make room in your schedule – you won’t be disappointed. 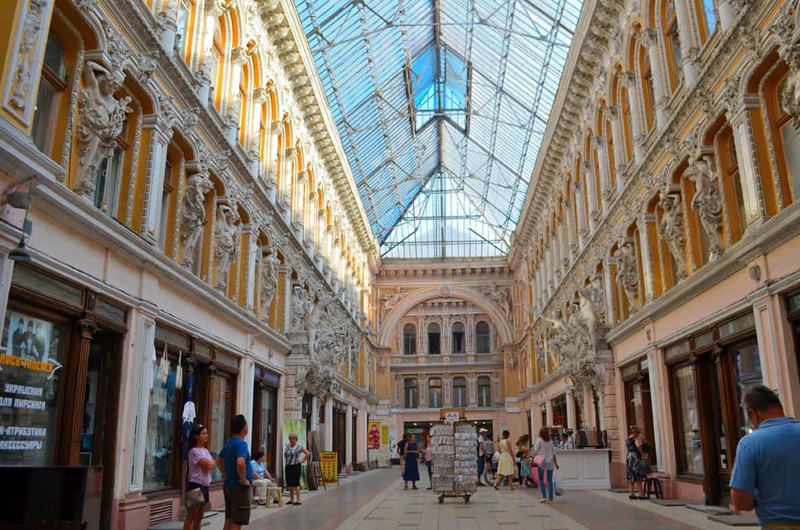 The Passage is another ornate building, constructed at the end of the 19th century and decorated with sculptures. The first floor is lined with boutique shops and cafes, and the upper floors are hotel rooms. The stunning skylight ceiling alone makes it worth a visit. The Passage was the known as the best hotel in Ukraine until the Bristol Hotel was opened. If you’ve seen the movie Battleship Potemkin, you’ll remember Odessa’s iconic landmark. The steps were built in the 19th century as a means to access the harbor. The fun fact about the stairs is that they form an optical illusion – if they are viewed from below, only a steep staircase is visible. However, the staircase is only 192 steps, 150 yards long and has a series of landings. 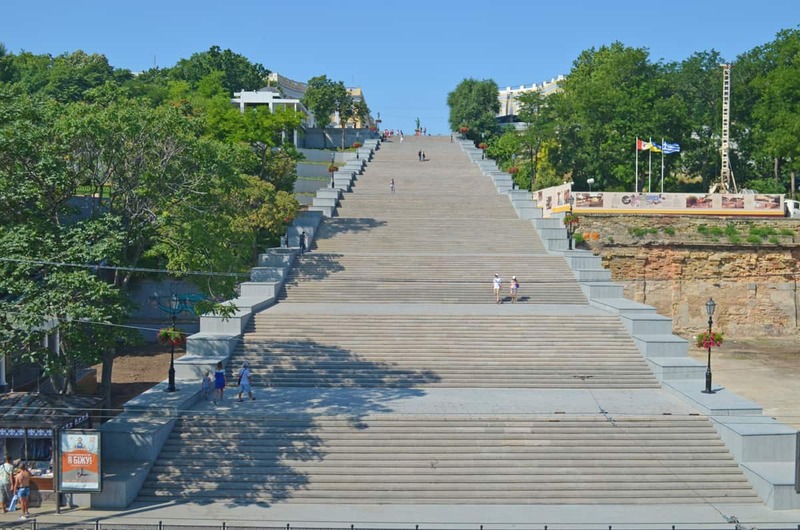 At the top, there is a monument to Duke de Richelieu, the founder of Odessa, along with a panoramic view of the harbor. Odessa is home to the world’s largest network of tunnels, running underneath the city. It’s a dark labyrinth of over 1000 miles that have been discovered to-date. 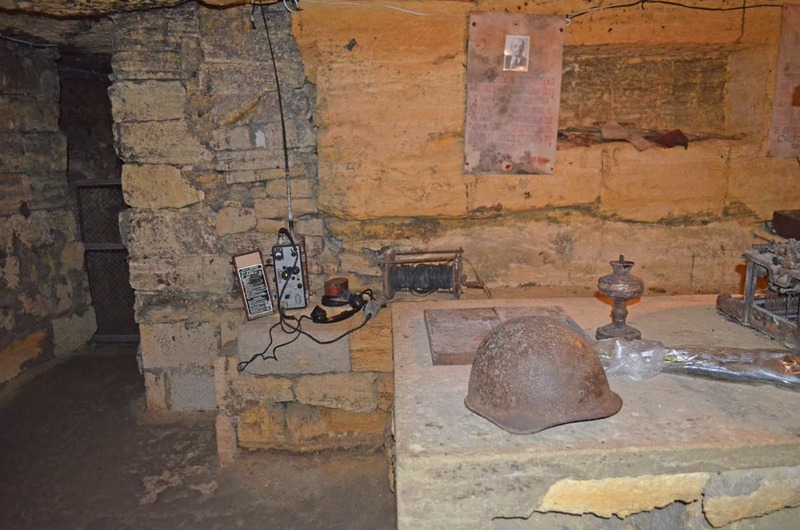 The catacombs are significant in that it’s where the insurgent Partisan army resisted and hid from the Nazis during World War II. Guided tours through the mysterious underground are available and should not be missed. Founded in 1803, City Garden it is the oldest park in the city. 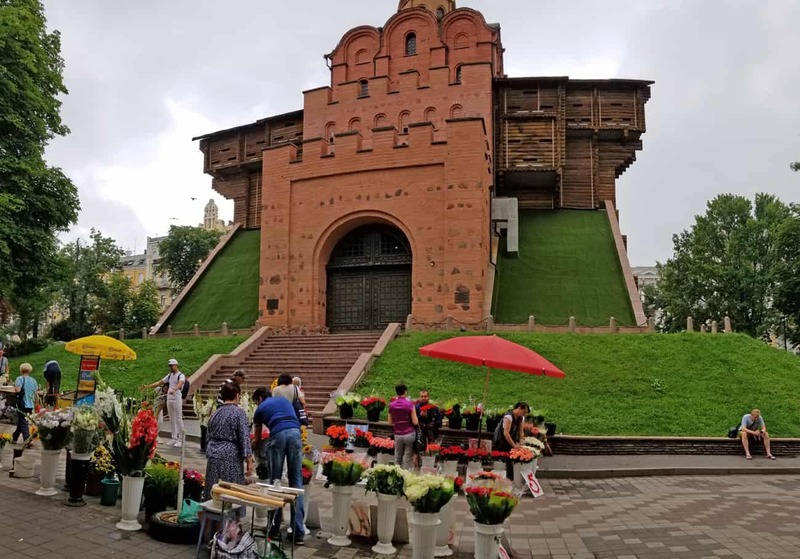 It’s located in the city center at Deribasivska Street and has paved paths and sprays of flowers everywhere you look as well as a local handicrafts market. 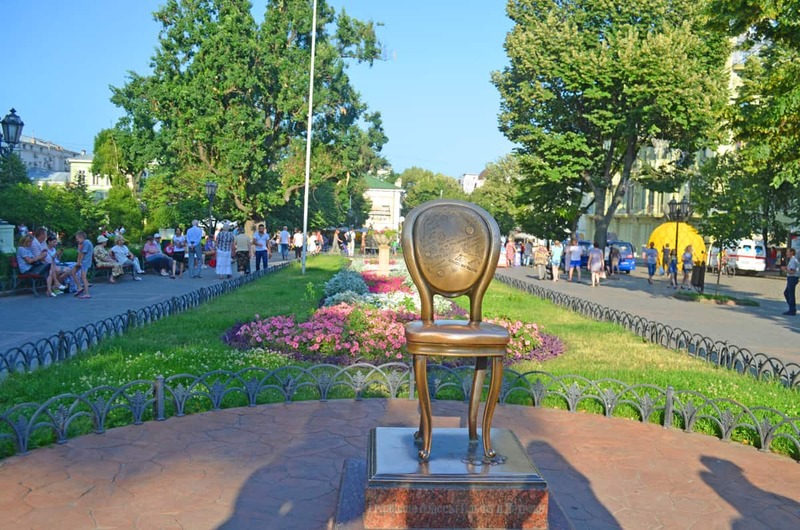 In the park, you’ll find a colorful craft market, and the 12th Chair Monument, from the 1970 movie The Twelve Chairs, an iconic symbol of Odessa. The movie depicts 1920 Soviet Russia in which a priest, a fallen aristocrat, and a con artist search for jewels hidden inside one of twelve dining chairs that had been lost during the revolution. Rumor has it that if you make a wish while sitting on the chair, it will come true. It is one of the most popular places for a photo, so be prepared to wait in a long queue. You can’t ignore the siren’s lure of the Black Sea. 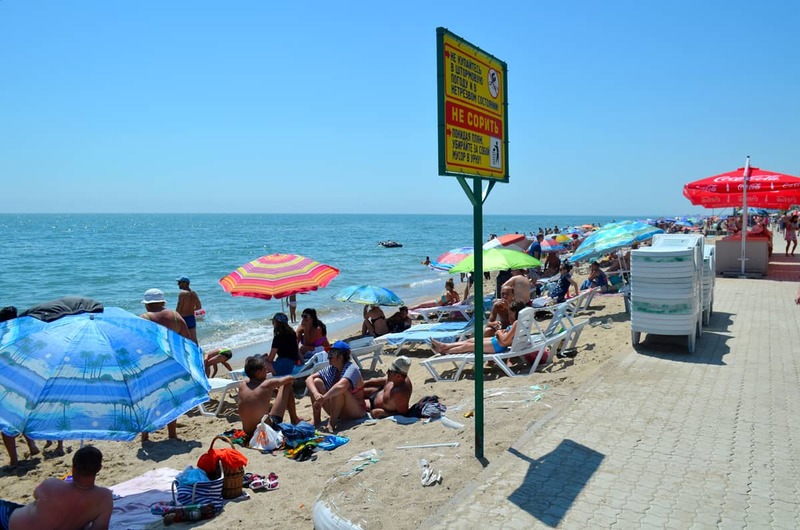 Arcadia, about a 15-minute drive from the city center, is the most popular beach resort and nightlife area, not just in Odessa, but in all Ukraine. Prepare to be mesmerized by the brilliant emerald green waves crashing onto a sandy-but-windy beach. 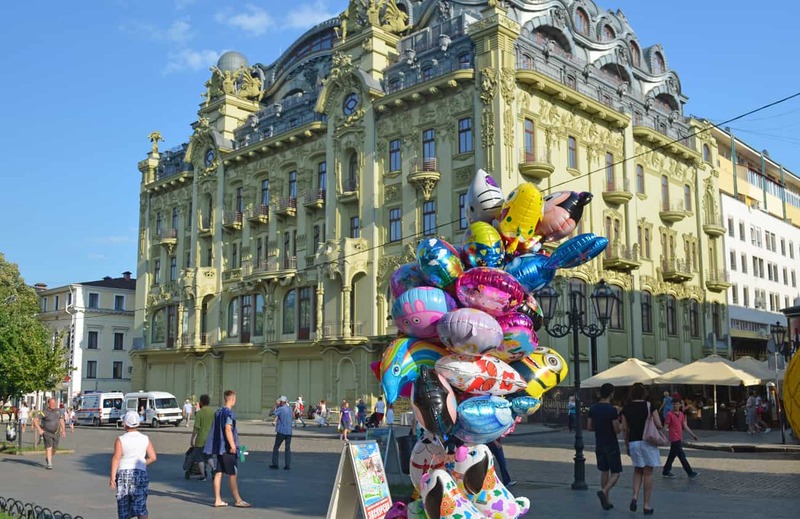 The main thoroughfare is lined with restaurants, souvenir shops, nightclubs, children’s amusements, and kiosks with Ukrainian street food. If you prefer a quieter beach than Acadia, take a short drive to the white sand beach of Zatoka, also on the Black Sea. Even though it can get crowded in the summer, the atmosphere is very relaxed. 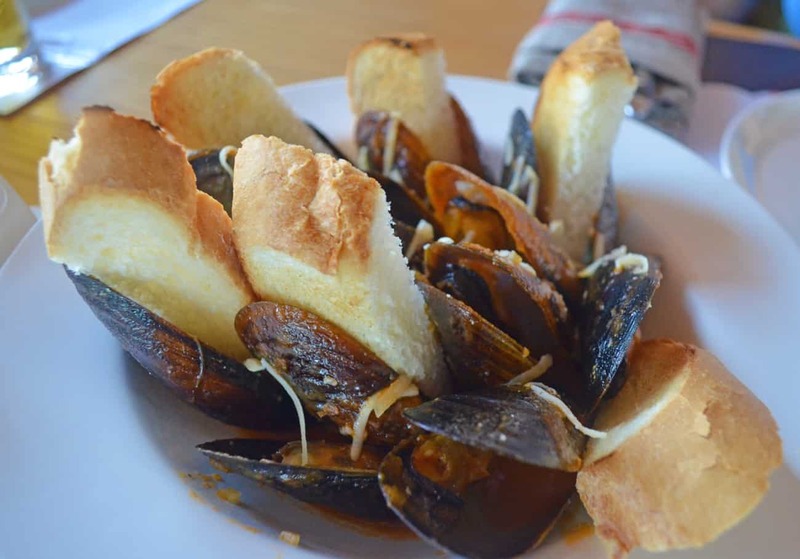 There’s a two-story restaurant at the end of the boulevard that leads to the beach, with nice sea views, and fresh Black Sea mussels cooked in either a savory cream sauce or spicy tomato sauce. In August, Zatoka hosts a jazz festival. 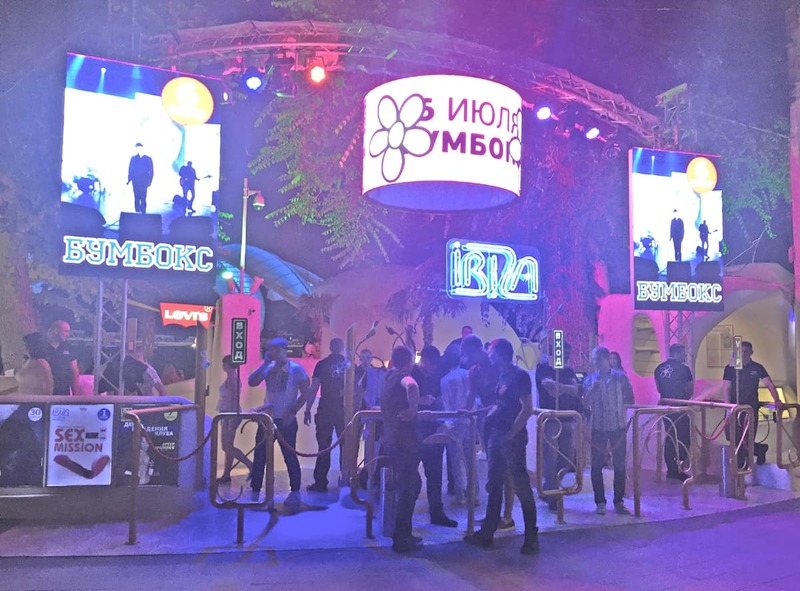 Odessa has a reputation for having the best nightlife in Ukraine, particularly in the summertime. Pulsating dance clubs with neon lights entice walkers to enter. Directly on the beach in Arcadia, Ibiza nightclub ushers guests down the stairs to a mammoth party area with bars, an elevated stage hosting a live band, and hundreds of shoulder-to-shoulder cocktail-drinking patrons. The atmosphere is frenetic and friendly. 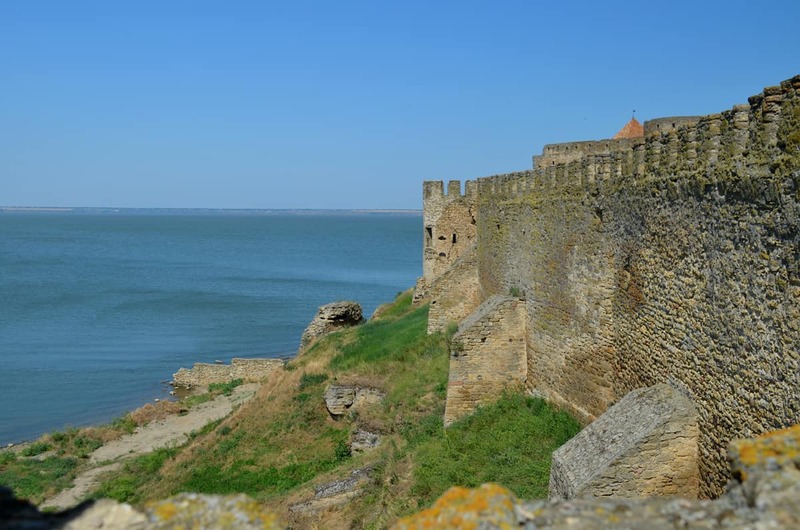 The 13th century Akkerman Fortress, built by Alexander the Kind, is one of Ukraine’s largest and best-preserved castles. The fortress was enlarged in 1440 under Stephen II of Moldavia, subsequently feel the Ottomans. The Turks named it “Akkerman,” which means “White Fortress.” The grounds are extensive with ruins, walls, and turrets that can be climbed for vistas of the area. Wine Culture Center Shabo is not your ordinary winery – it’s a 2.5-hour comprehensive tourist experience unto itself. 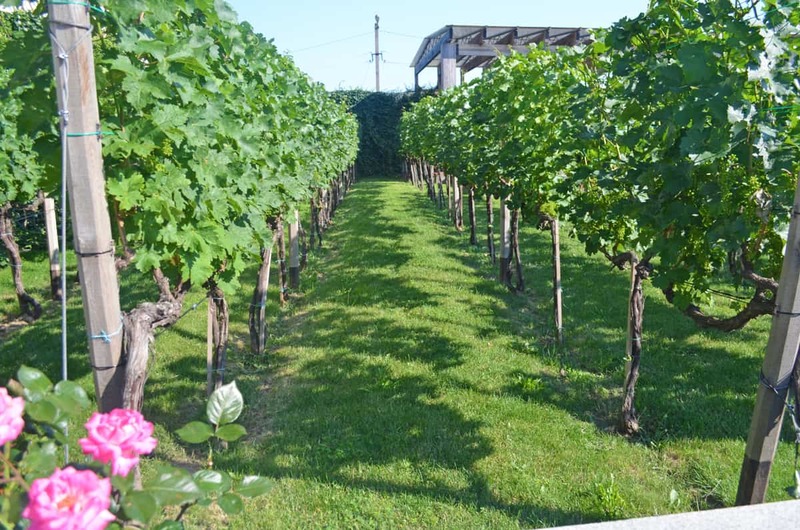 A tour of the slick operation starts with a walk past the vineyards, onto the wine-making and storing process, past modern sculptures and fountains, underground exhibits, a historical “walk-through-time” museum with mannequins depicting their 200-year-old Swiss heritage from the first grape harvest in the area to current times, to a company film, an opportunity to taste their various types of wines, and lastly to the ubiquitous company store where one can purchase wine and souvenirs. 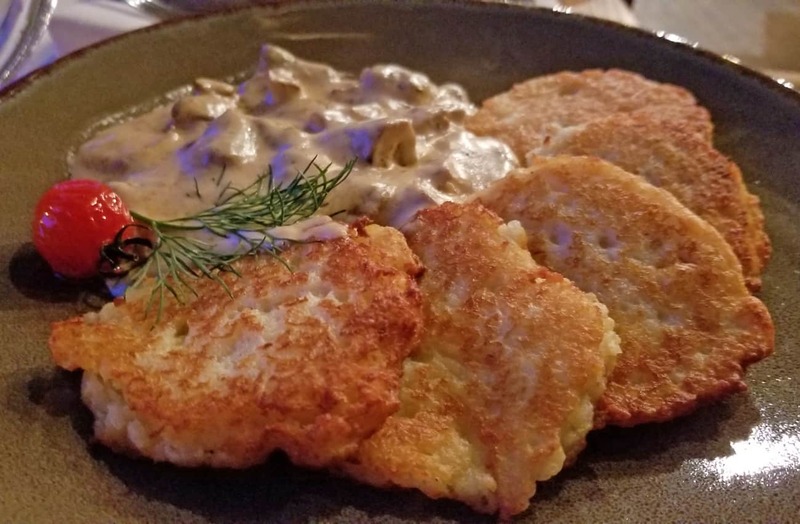 Naturally, you’ll want to try this well-known Ukrainian entré. The dish is made of a boneless chicken fillet pounded thin. Then cold butter is placed in the middle and the fillet is rolled around it, dipped in a beaten egg solution, rolled in breadcrumbs, and either fried or baked. 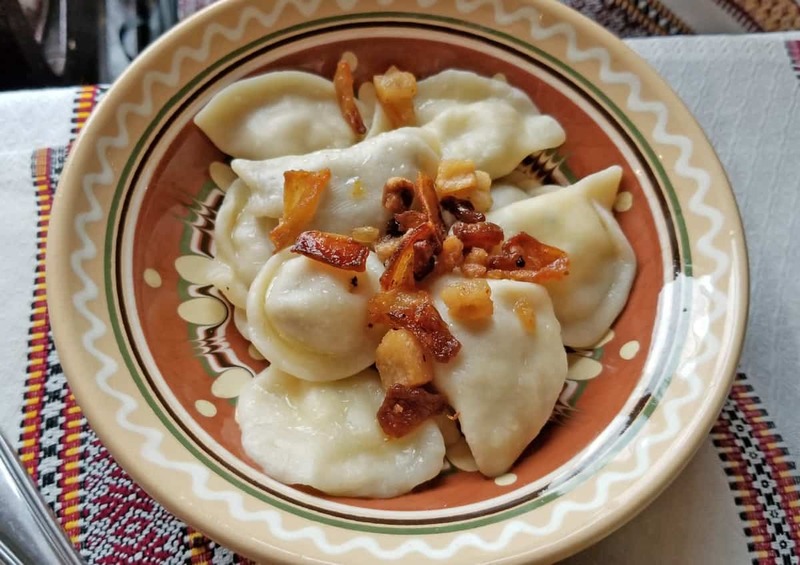 Varenkny, also called pierogis in some regions of Western Ukraine, are traditional dough dumplings filled with mashed potatoes and fried onions, minced meat, or pickled cabbage. They can also be filled with fruit such as cherries and served with sour cream and honey as a dessert. In Kiev, I took a cooking class to learn how to make them – a delicious and fun experience! Do you think coffee was invented in Vienna? Well, yes and no. In the 17th century, war hero Yuriy Frants Kulchytsky brewed the first cup of coffee in Vienna…BUT, he was born in the Lviv Oblast. However, at that time, Lviv was part of the Polish-Lithuanian Commonwealth, so it gets even more convoluted. One thing that’s undebatable – there are a lot of coffee klatches in Lviv and the coffee is superb! Borscht is a sour soup popular in Eastern Europe. The main ingredient is beetroot which gives the dish its distinctive red color. There are dozens of variations, but my favorite had slices of tender beef in the broth. Other ingredients can include cabbage, carrots, parsnips, tomatoes, sausage, dill, and/or sour cream. 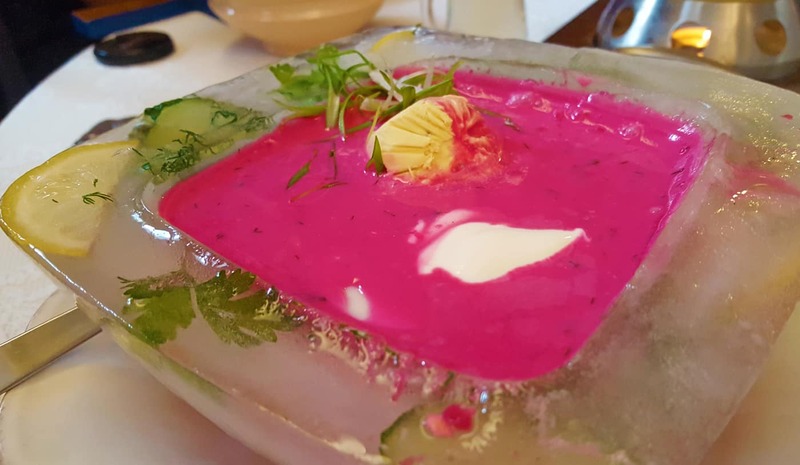 Borscht can be served either hot or cold. Check out the ice bowl serving – food presentation doesn’t get any prettier than that! Deruny are Ukrainian potato pancakes. 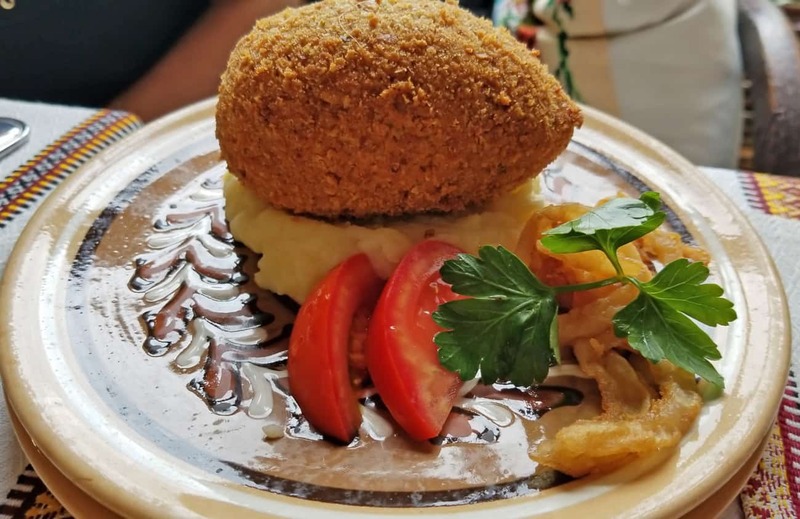 Unlike the American version which are made from left-over mashed potatoes, the Ukrainian style uses finely-grated raw potatoes and onion, fried crispy golden brown, and served with sour cream. The mussels fresh out of the Black Sea in Odessa were to-die-for! 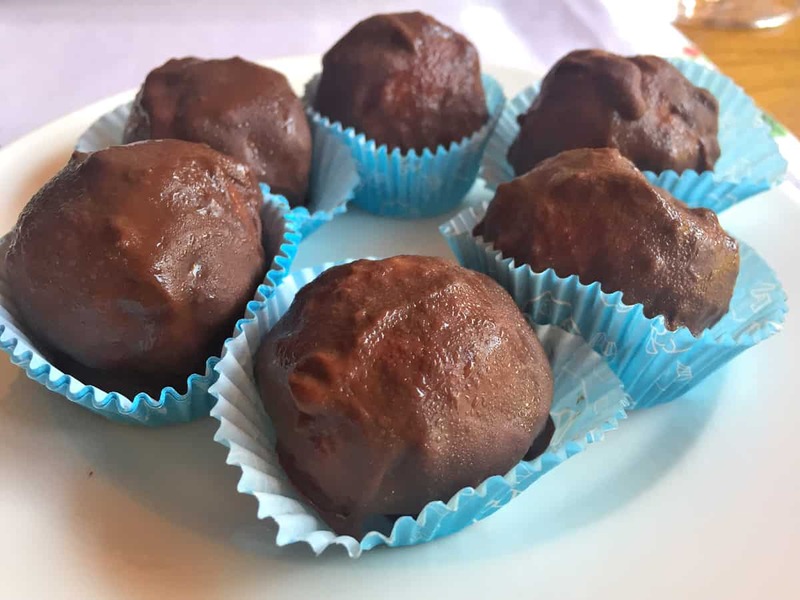 They were served in various ways – cooked in a savory cream sauce, cooked in a spicy red sauce, or cooked naturally and then garnished with melted butter. All three were sensational. The Middle Eastern dip or spread made from cooked and mashed chickpeas, blended with tahini, olive oil, lemon juice, salt, and garlic was one of my favorite things to eat in Lviv. In an outdoor café in the old Jewish quarter, we were served a lavish platter of hummus, each one with a different flavoring. Who needed an entré? I gobbled down enough pita pieces slathered with the delicious spread to fill me up. Kholodets is a glutinous dish made from meat broth. 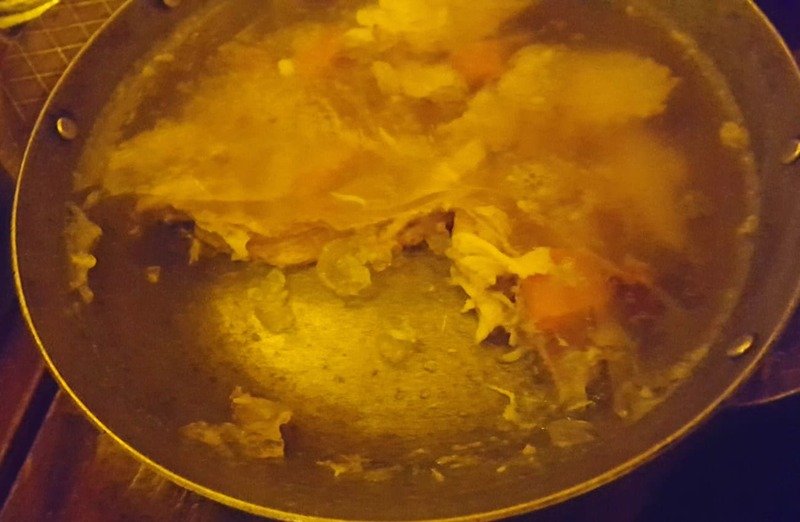 The pieces of cooked meat and carrots are held together in the transparent broth-turned jelly mold, and it’s served cold. I dare you to try it. Lviv became a paradise for chocolate lovers in the late 18th century. The chocolate is handmade, and there’s an annual National Chocolate Festival with nine-foot chocolate sculptures. 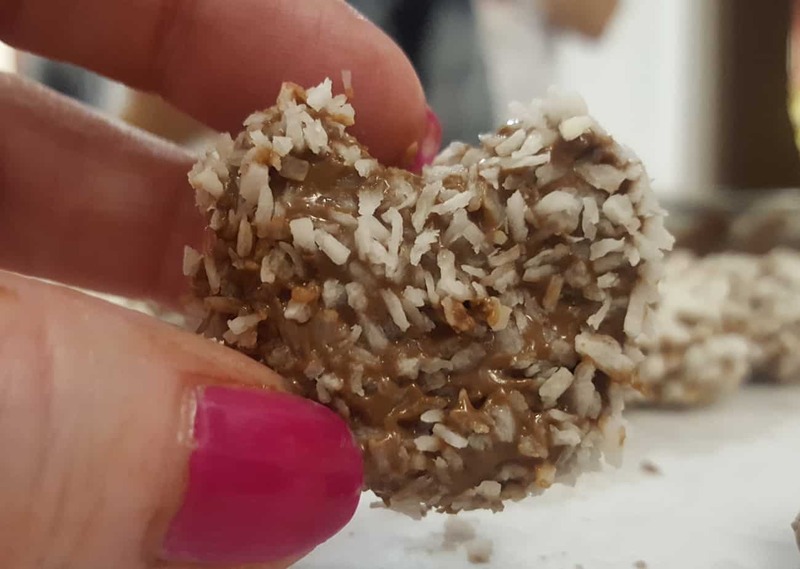 I tried my hand making the luscious treats at Lviv Handmade Chocolates. The only problem was that I ate more of the ingredients than I made. Yummy fun. “If you don’t drink, you are either sick or a spy,” said Ivanka, our host. What could I do? I didn’t want to blow my cover. 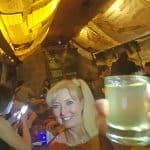 On this liqueur tasting tour in Lviv, I got to try a dozen or so of their local handmade liqueurs, like visnjevaca – sour cherry, and horseradish horilka. 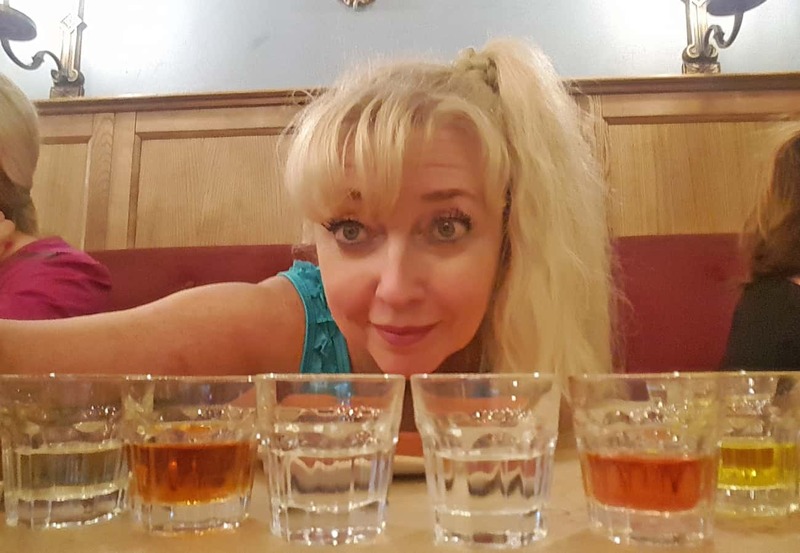 My favorite is medivka – honey vodka – I couldn’t get enough of that. Salo is pig fat that Ukrainians use in place of butter or in recipes. The fat can have flavorings like garlic added to it and will usually be served with your bread in restaurants. Tricky, tricky, it can also be disguised in a coating of chocolate that looks very inviting, so beware. At the very least, take one bite, though, just to say you tried it. The time to visit Ukraine is NOW. It’s undiscovered. It’s uncrowded. It’s inexpensive. It can benefit from tourist dollars. And most of all, it’s chock-full of beautiful and fascinates sights. 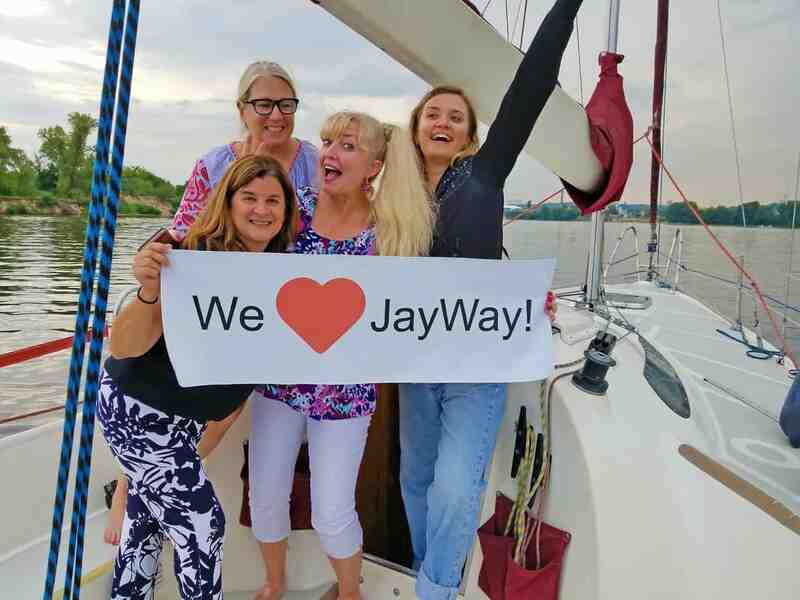 Disclosure: The author was honored to be the guest of JayWay Travel during her stay in Ukraine, but as always, the opinions, reviews, and experiences are her own. 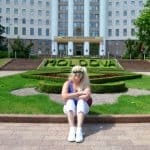 9 Things to Do in Moldova. I Dare You to Try Number 7. Tagged Kiev, Lviv, odessa, ukraine. 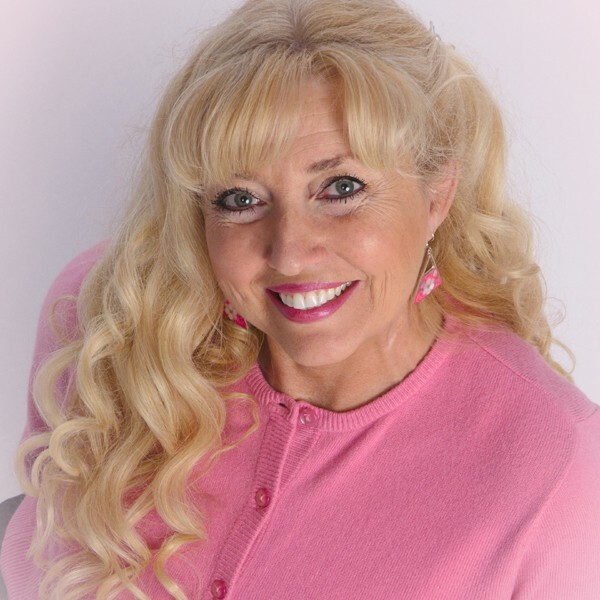 Superb factors totally, you only received a fresh visitor. Just what is it possible you . IBM 8203recommend of your placed which you simply made at times in past times? Just about any certain? 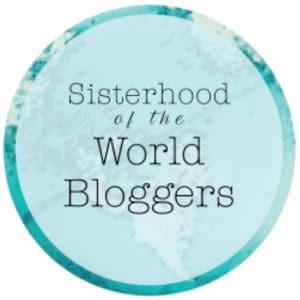 You can add a 3rd reader/commenter with genealogical roots in Ukraine. From what I understand, ancestors from my paternal grandfather’s side of the family came from Lviv–which was part of Poland when they fled. 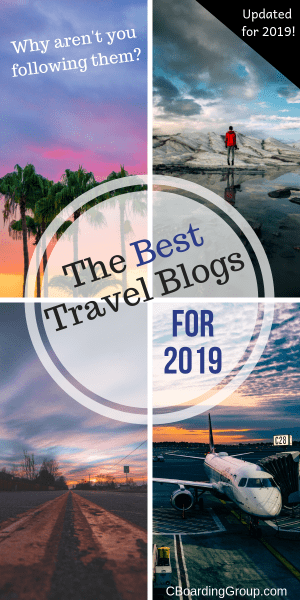 This comprehensive post and great photos have made me add Ukraine to a bucket list journey to places in eastern Europe we have not yet visited, including Bulgaria where Mr. Excitement’s parents were born. I don’t bookmark anymore. I pin and this will be pinned as soon as I stop writing. I’m beyond delighted that I had a part in adding Ukraine to your list. It’s a fascinating place, and I know you and Mr. Excitement are going to love it, along with other parts of Eastern Europe. It’s so different from the extreme crowds in other parts of Europe, and Lviv is just lovely. Make sure to check out my latest post about the food experiences! 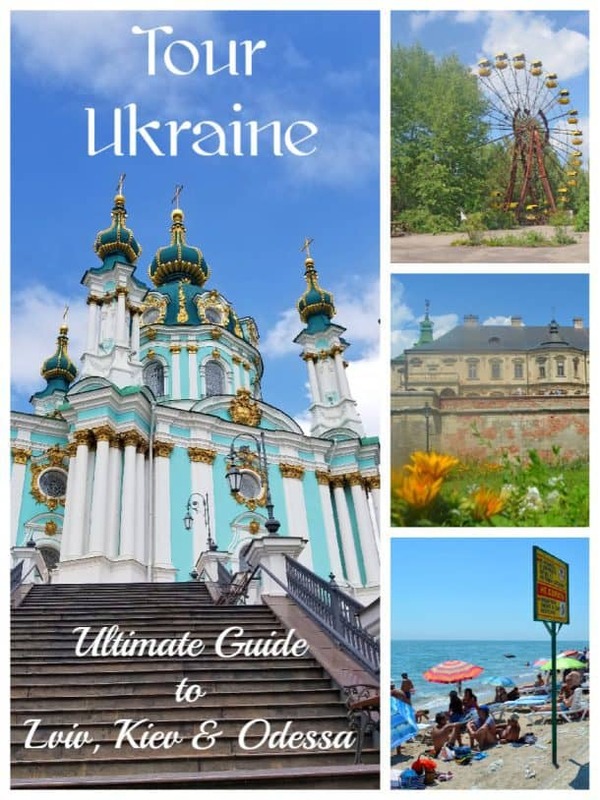 I’m thrilled to discover such a comprehensive guide to Ukraine! I’m going to Ukraine in the spring for genealogical research ( my family is from the town of Borshchiv – home to some great borsht hopefully? ) so I’m pinning this post for future reference. Oh, you are going to love it Michele! I can only imagine visiting and knowing it was my heritage! Such a great guide for the Ukraine! Fall in Love With the colorful Buildings. So glad you liked it! Yes, the architecture is stunning! I am envious, Patti! I am of Ukrainian heritage and have not yet been to Ukraine. Your post has certainly piqued my interest and also explains why I am so in love with sunflowers! You have to go, Doreen! 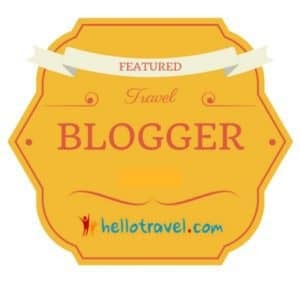 Especially to Lviv which specializes in chocolate (see latest post)! OMG, Ukraine is so colorful, charming, and captivating. 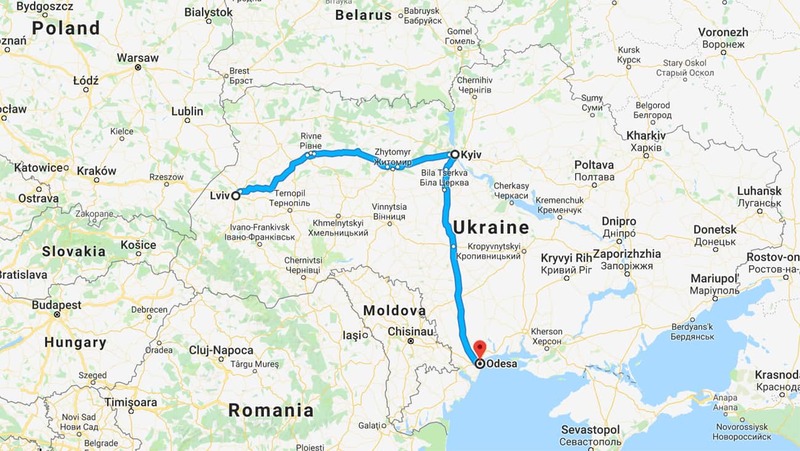 I would go to Kiev, Lviv, and Odessa in that order. I will not miss those churches! And I want to have authentic chicken kiev! It really is a lovely and diverse place! 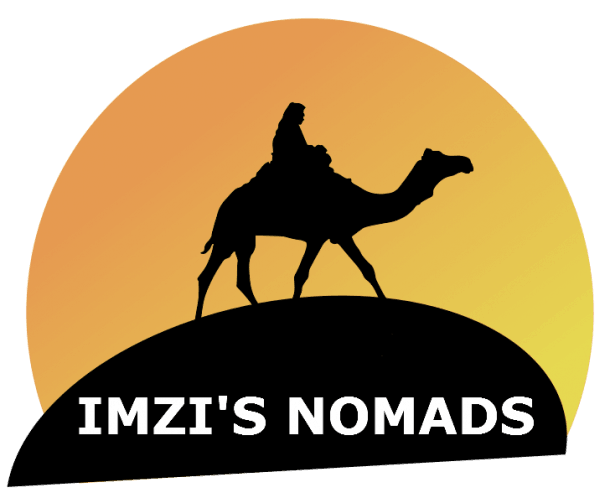 Want the insiders' travel secrets?